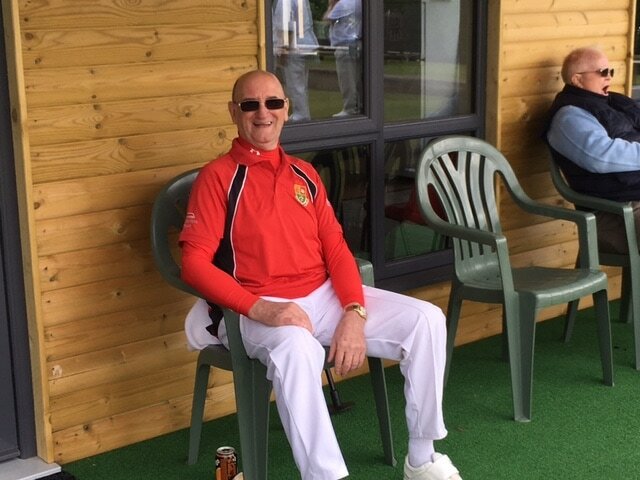 The last PG1 match of the season and after a revolutionary selection by Captain Mark Krawiecki there was some hope of signing off the season with a victory. 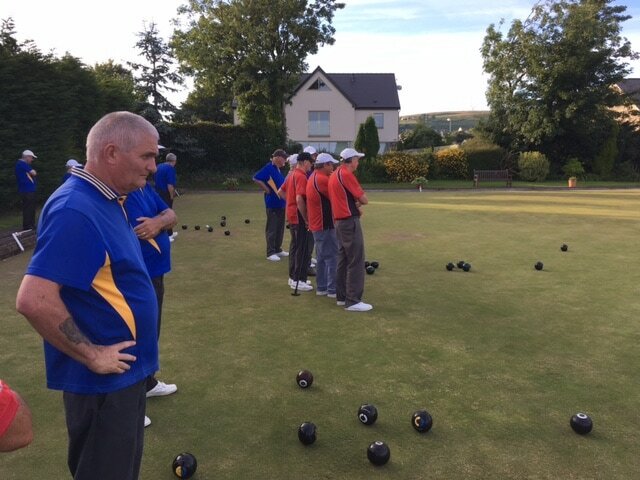 In the end, it very nearly paid off with Pentyrch losing by only 3 shots, one winning rink and two rinks losing by one and two shots respectively. Considering some of the results this season it could be considered by some as being a success.The record will not show it as victory, however. 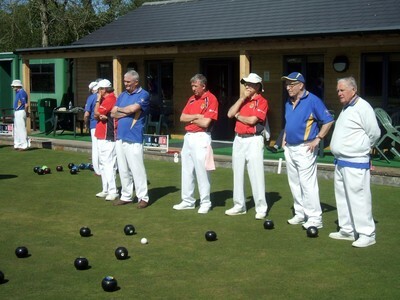 Pontyclun won narrowly and still have a chance of promotion. Pontyclun Bowls Club have the magnificent historical building of Pontyclun Institute Athletic Club as their home and it is worth reading some of the plaques and notices in the foyer that tell of its fascinating history. There is an intriguing inscription above the fireplace that reads in Latin "In quo corriget?" an extract from the Old Testament book of Psalms. Psalm 119: 9-16. Upon inquiry of the locals, no one could explain its meaning. The author has done some research and found that it translates roughly as "How can a man stay on the righteous path?" 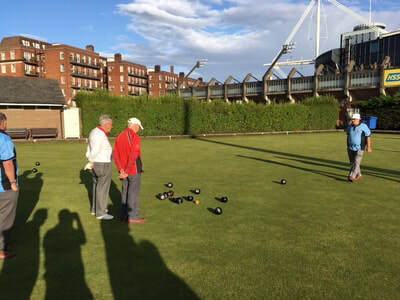 In the context of bowls a relevant question for the visiting team! 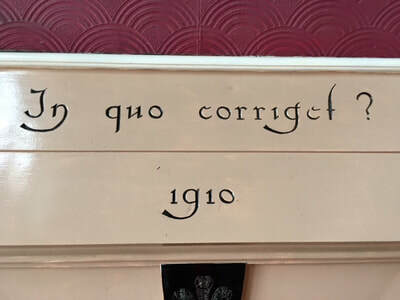 Ironically, a number of whom sat unknowingly in front of the inscription drinking pints of refreshing lager and beer before going onto the green to compete. Onto the match: Brian Ilbery led a strong rink with Dave Ashmore, John Davies and Iain Russell and they did not disappoint staying ahead from start to finish winning 22-16. Ian Broxton with Brian Pearce, Denzil Thomas, and Barrie Thomas were leading 10-8 at the 13th end and then conceded 7 unanswered shots, then scored 6 in the 19 and 20th ends leading 16-15 into the final end. Unfortunately, they dropped 2 at the last and lost 16-17 - so near... Colin Howson with John Beacham, Russell Howell and the refreshed Keith Davies played well, opening up a 16-6 lead at the 10th end. 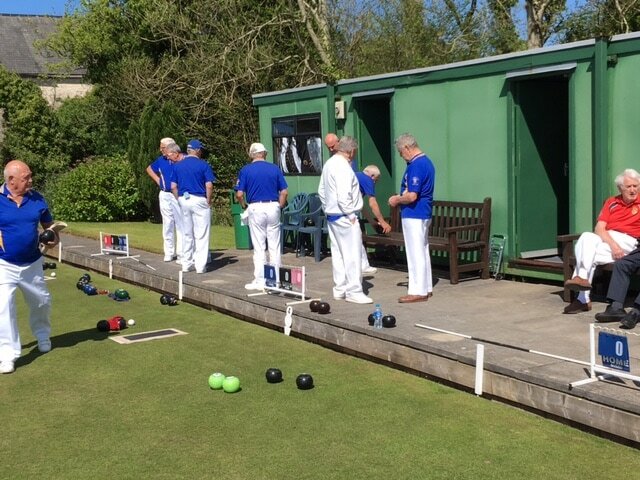 Pontyclun began to claw back and a 5 for them at the 19th end saw them take the lead 24-21. 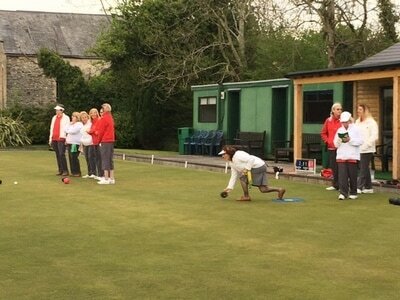 One end won for each team then left a final score of 25-23 in favour of Pontyclun. 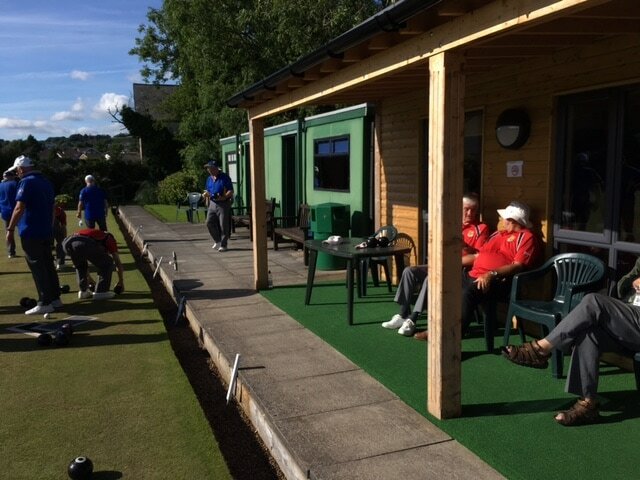 Mark Krawiecki's rink who had been the dubious winners of the best losing rink in the last 3 matches by only 3 shots were the day's worst losers by 6 shots. 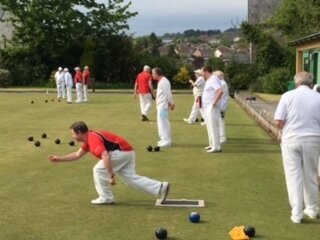 The game was close with Pontyclun slightly ahead until the Tyrchs edged to 10-11 down at the 14th end. 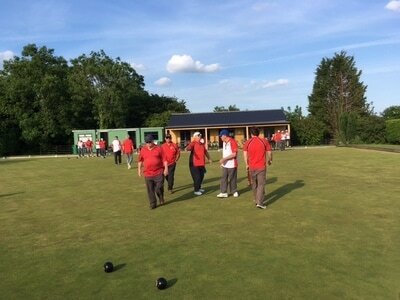 The next end a dropped 4 was the start of a mini collapse being 11-22 down at the 20th end. 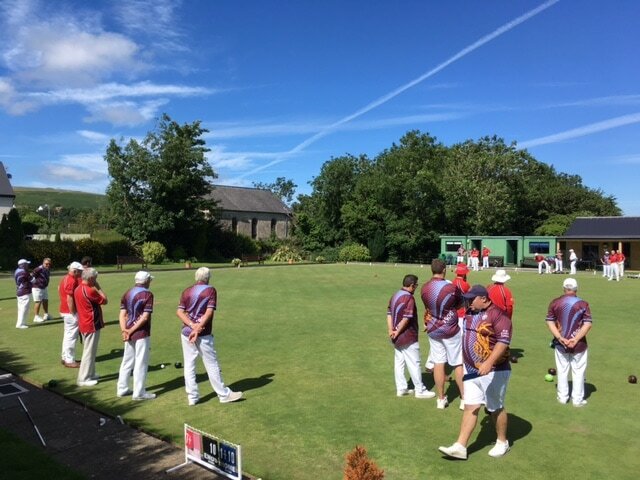 A stunning 5 and thus the last word for Pentyrch at the last end meant the final score was 22-16 in favour of the home side skipped by the invariably accurate Rich Price. Mark Krawiecki's rink included Nick Russell, Peter Mynett and Howard Thomas who in particular had a great game as lead. In the after-match speeches Captain John of Pontyclun thanked Pentyrch for the competitive match and stated that if promoted we would not meet next year. Mark Krawiecki replied wishing them good luck in their final push for promotion. 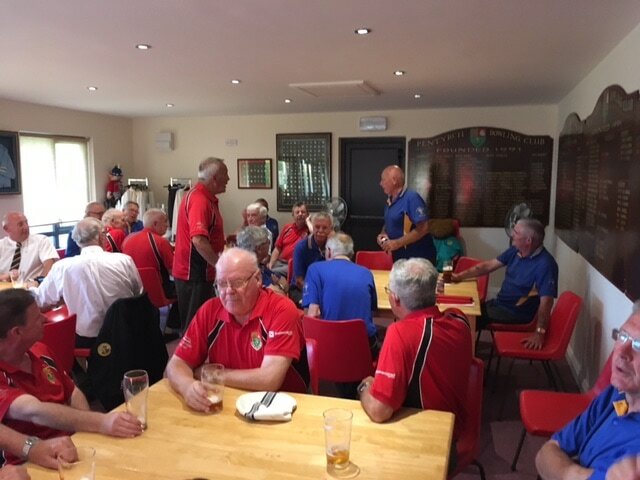 He also thanked the Pentyrch players for their support and commitment during the season and thanked the other players who also captained the side this season: Howard Thomas, Ian Broxton and Iain Russell. 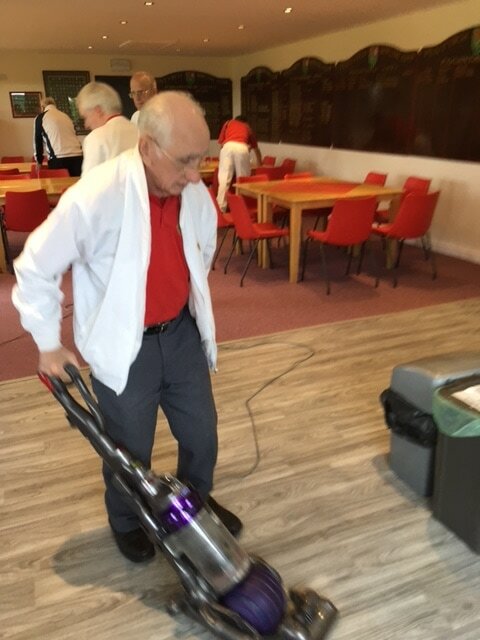 A demonstration of the commitment and co-operation of the team. After that we all went home choosing the right path to go! 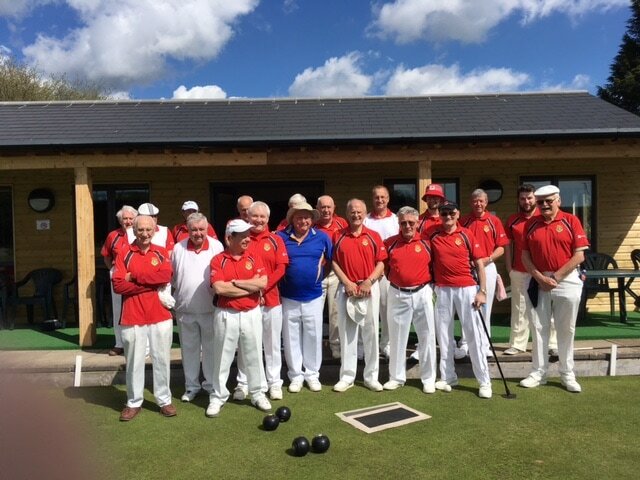 Anyway this was the penultimate PG1 match of the season, (with a match at Pontyclun next Saturday and the final match of the season vs. Taffs Well on September 16th) and sadly another defeat for the Tyrchs. 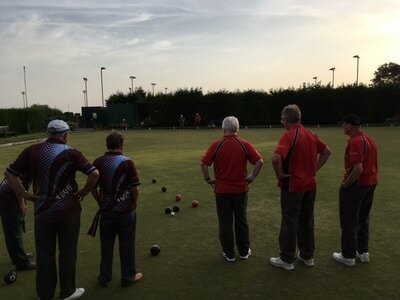 Barrie Thomas with John Eagle, Denzil Thomas and John Davies lost 10-16. Colin Howson with John Beacham, Russell howell and John Berry were only 10-11 down at the 12th end but then the floodgates opened and they went down 10-23. 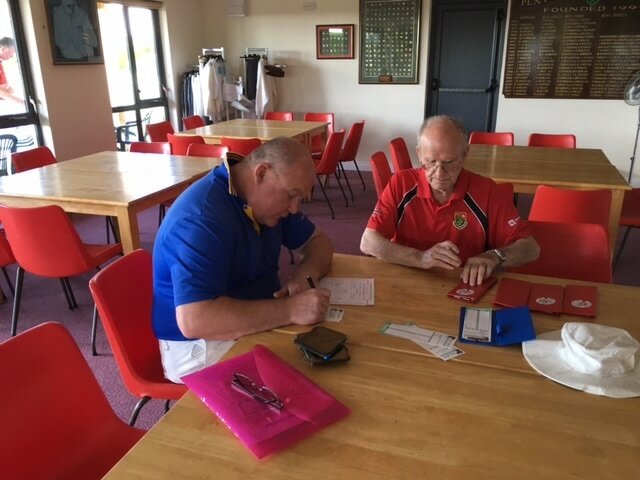 Ian Broxton, with Howard Thomas, Peter Mynett and Brian Pearce lost by 10 shots, 9-19. 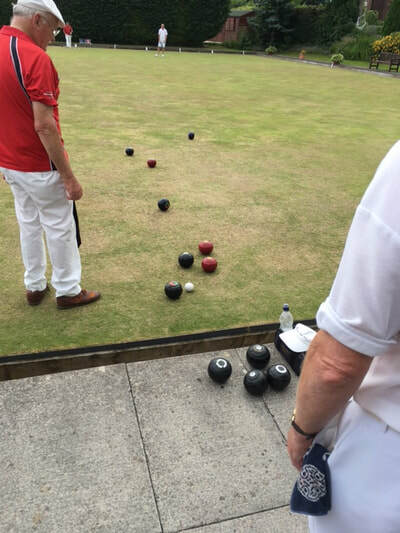 Mark Krawiecki's rink with Keith Capron, Alan Lowndes and Nick Russell came closest again, losing 12-15 : a game that could have gone either way. The captains, Mark Krawiecki and Martin Summerhayes wished each other's teams well and looked forward to resuming competition next year. Bank Holiday Weekend and a trip to the seaside for Pentyrch in this PG1 fixture. In contrast to many August Bank Holidays and to the recent weather, it was a warm, pleasant and sunny afternoon at the Rectory Road green. 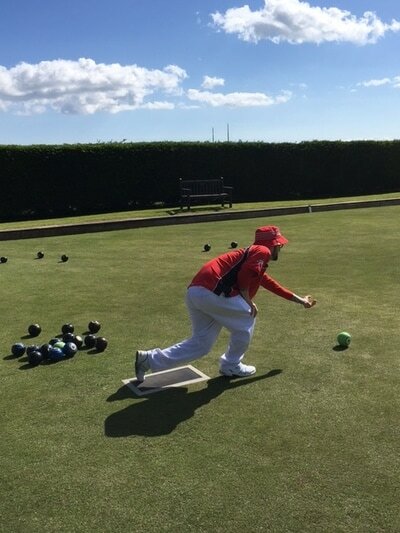 With holiday season well and truly on us, a number of players were unavailable and we were glad that Bryn Owen and Owen Morris stepped in to help field a team. 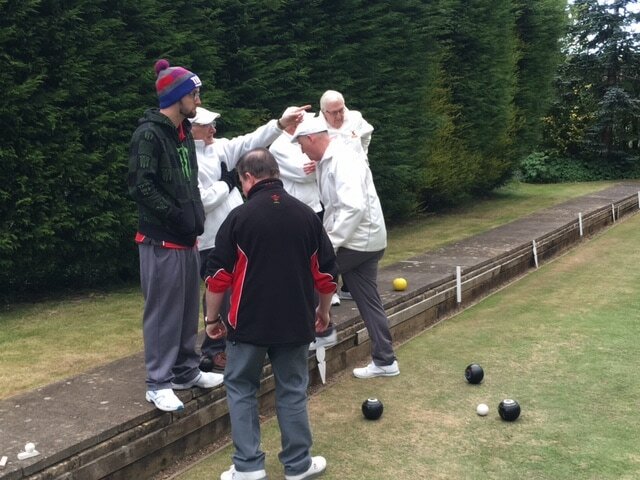 Another comprehensive defeat, unfortunately with all four rinks unable to get a win. 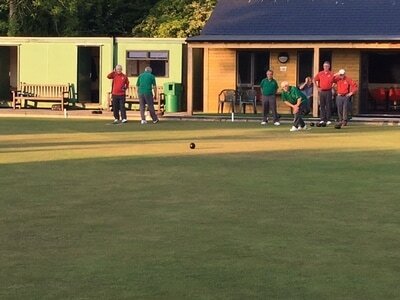 Unusually, the match was played to and away from the clubhouse because of some damage to part of the green by a fox. 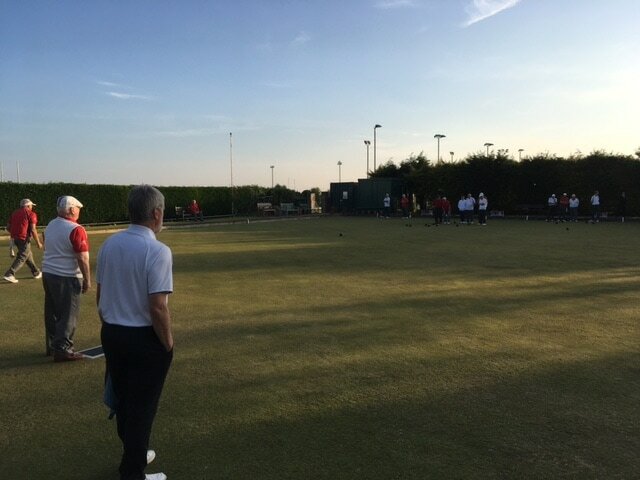 Mark Krawiecki's rink with Keith Capron, Denzil Thomas and Nick Russell came closest to getting a win, losing 16-19. 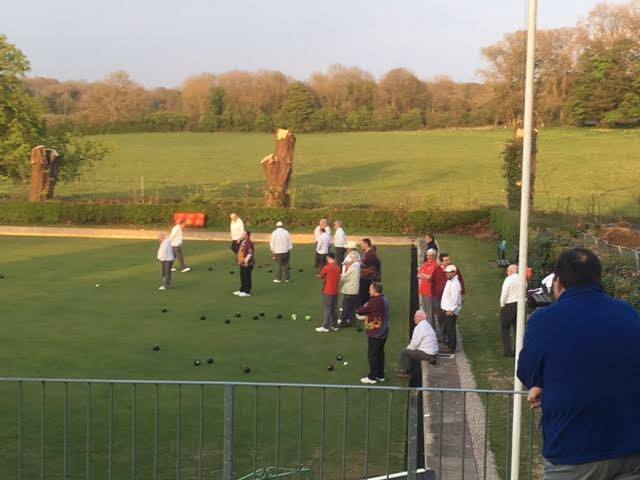 They started badly being 10-3 down after 10 ends, fighting back to 10-10 by the thirteenth only to drop a 4 at the next end. That 4 proved too much to recover from. 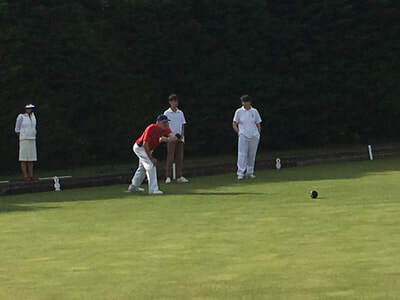 Barrie Thomas with John Beacham, Owen Morris and John Davies raced away to a 6-0 start after 4 ends but flattered to deceive only scoring 8 more in the match while conceding 26, losing 14-26. 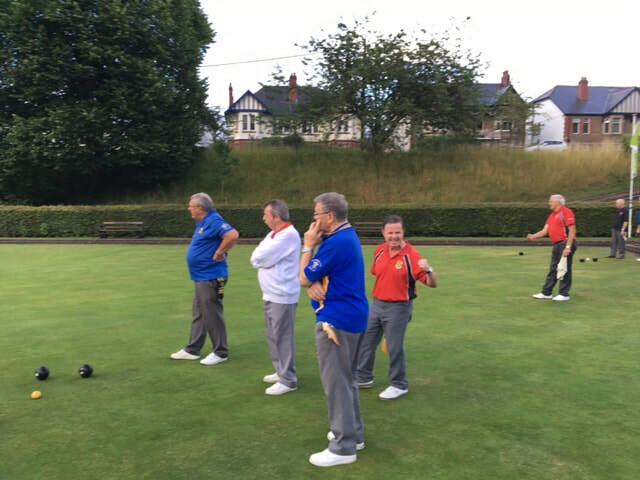 Ian Broxton, Peter Neville, Bryn Owen and Howard Thomas, although behind all the way through, managed to stay in touch until the 14th end after which they let in 14 shots before their own late flurry of 6 in the last 4 ends, losing 18-26. 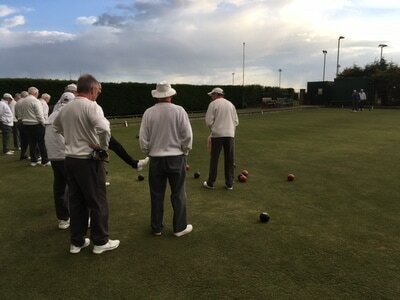 Finally, Colin Howson backed up by Brain Pearce, Russell Howell and Don Wibley had parity at the ninth end being 7-7, then dropped a 6 at the next end, from which they did not recover, losing 12 -23. 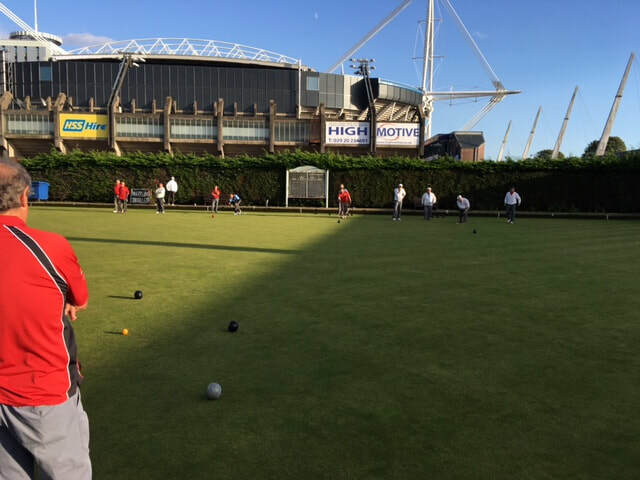 We will come back next year for the outdoor season but before that will come back to Penarth for our two, now traditional winter fixtures in the short mat format. As usual, we were treated warmly by our hosts and to great after-match refreshments. Thanks to the Ladies of Penarth. 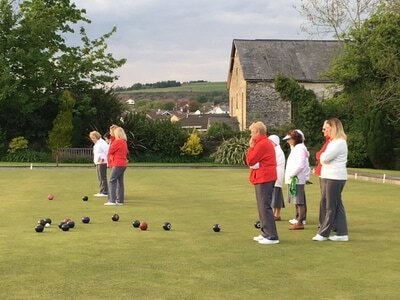 The penultimate match of the season for the Ladies and the sun shone brightly for the visit of Porthcawl. Due to player availability, Pentyrch Captain Eileen and Porthcawl captain agreed on a third rink of triples and agreed for two youngsters from Porthcawl and four Men players from Pentyrch to be involved in the match. 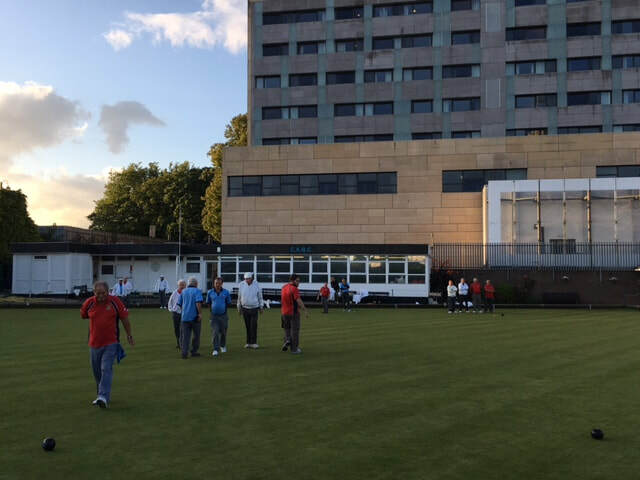 This meant that the match went ahead with some good bowls played, everyone had a great time in playing together and two younger players got some enjoyment from the game and, hopefully, will have the enthusiasm to play the game in future. This is what our game desperately needs - thanks for playing. Thanks too, to Howard, Peter, John and Don for playing too. And so the season begins to draw to a close and almost finishes where it began, at St Fagans on the 19th April (scroll to the bottom of this page, dear reader). 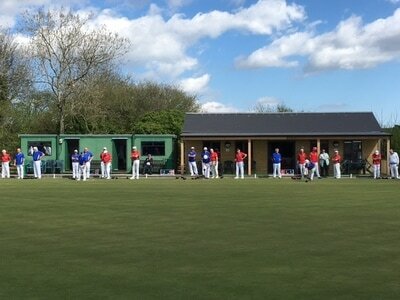 This was the fourth meeting of the clubs this season and the fourth time that St Fagans were the winners although today, at around halfway through it looked as if the pattern of results may have changed ( for one rink in particular, more of which later). After the terrible weather this summer it was good to feel the warmth of the sun on our faces and backs and not to have to run for wet gear and umbrellas. For Ian Broxton it was from victory last Wednesday to a 10-27 reverse today. Ian's rink included Howard Thomas, Russell Howell and Iain Russell. At the 12th end they were 8-9 down and then collapsed only scoring 2 against 15 to lose by the aforementioned score. 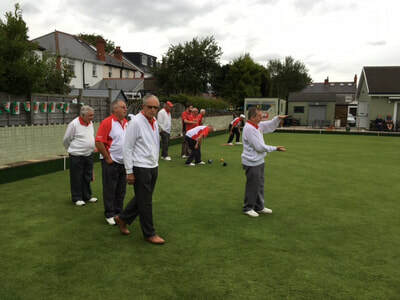 A similar story on Barrie Thomas's rink who with Bernie Simpson, Denzil Thomas and Don Wibley were 11-11 at the 13th end then going on to score only one more shot against 10 conceded losing 12-21. 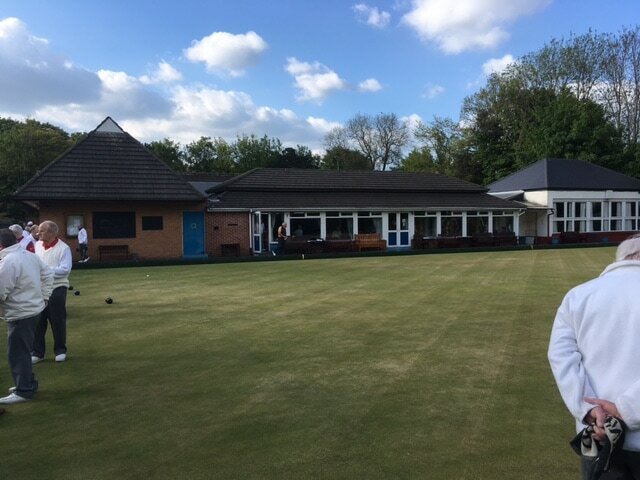 Brain Ilbery's rink bucked the trend being 5-1 down after 3 ends but then coming back and staying level to the 16th end at 13-13 and then pulling away with a sprint finish that Justin Gatlin would have been proud of (not drug assisted), and finishing worth 23-14 winners. Now, dear reader, prepare yourself for a tale of Greek tragi-comedic proportions, a tale of heroism, elation, unfettered joy then, anxiety, bewilderment and finally utter despair. 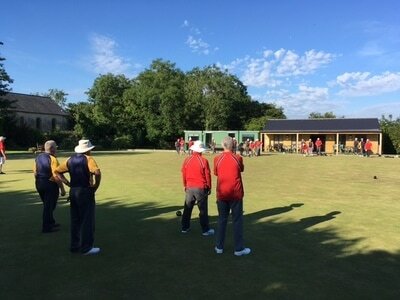 Mark Krawiecki's rink played in a match that could be fittingly labelled with many sporting cliches: "snatched defeat from the jaws of victory","a game of two halves", "robbed", "gutted" even "sick as a parrot". 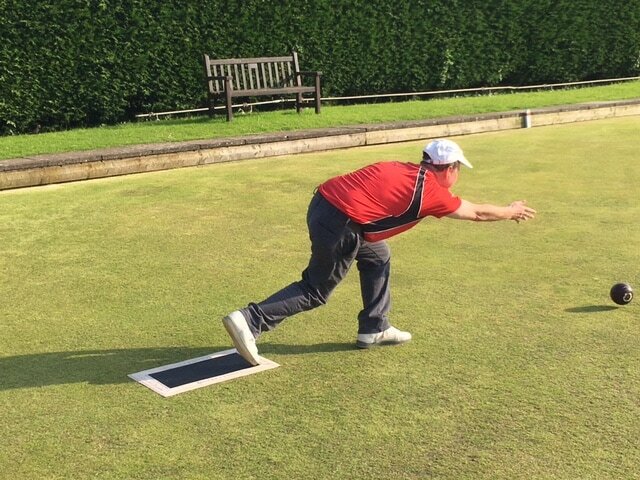 As far as the 13th (unlucky for some) end Mark Krawiecki (up until this time), well backed up by Dave Ashmore, Brian Pearce and Colin Howson could do no wrong building up a very convincing 17-2 lead. 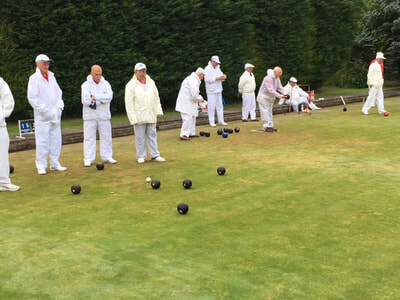 7-0 up after 3 ends they picked off 1's and 2's as Darren Turner, the opposition skip, with egg yolk yellow woods became increasingly frustrated firing and missing. The ends ticked on and the margin of points grew like the pile of sand at the bottom of an egg timer. Then the sand stopped flowing for Pentyrch...It was as if the gods above had had enough of the Pentyrch rink having their own heroic way and somewhere up above, in the azure skies above St Fagans they decreed that it would be Darren Turner's day! 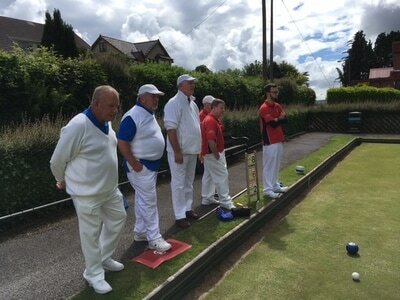 Suddenly the men of Pentyrch's previously unerring accuracy was wayward and with growing confidence the opposition gained strength. 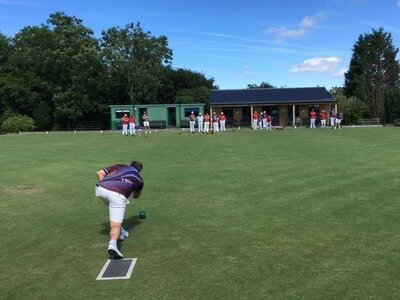 Two 5's at the 15th and 19th ends were crushing hammer blows with Pentyrch only able to try and cut down with defensive attempts for the remaining ends, finally losing 21-18. Quote of the day came from Colin Howson who philosophically said, "Oh well, it was fun while it lasted." Which is very true. So, moral of the day is that it's not over until the fat lady sings and she sang very loudly for St Fagans. Some small consolation with the after match meal of pie and chips. Thanks to Mike Hill's wife and mother-in-law. See you next year. 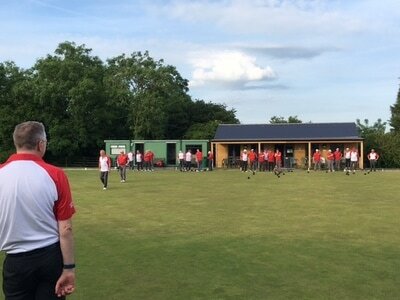 This was the last Cardiff Midweek League fixture of the season, although one rearranged PG1 fixture for Wednesday 30th August at Cardiff Athletic remains. The weather forecast had predicted heavy rain for the start of tonight's match but thankfully, the rain stayed away until after the match had finished. A last minute change saw Mark Krawiecki stepping in as skip for Brian Ilbery. 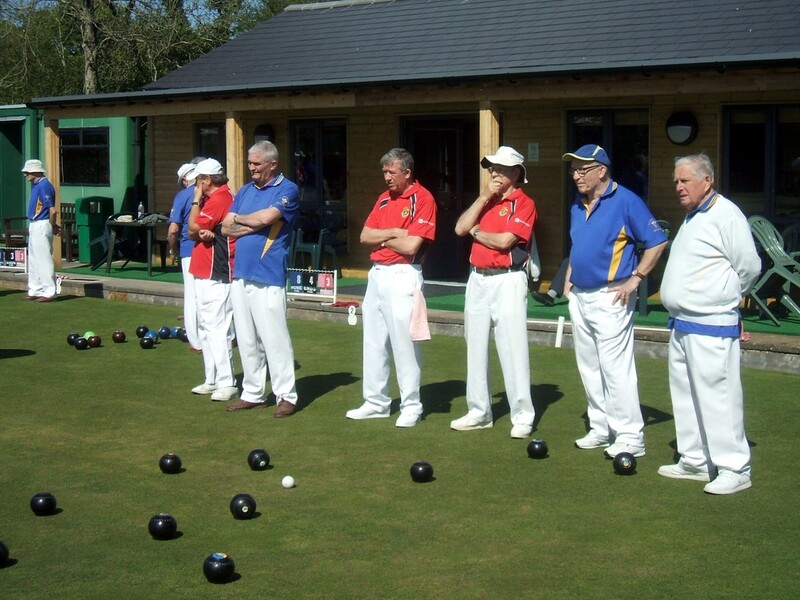 The result was revenge for the home team who had lost at Pentyrch earlier in the season. 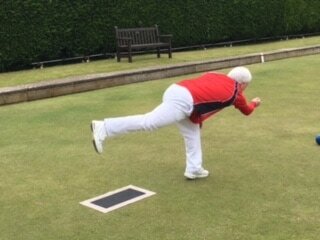 Nick Russell played as skip for the first time and after a torrid start recovered well to eventually lose 13-17. He was backed up by Dave Ashmore, John Eagle and Colin Howson. By the eighth end they were 13-3 down but made steady inroads into the opponents' lead, running out of ends in the end! Iain Russell with Jeff Tarr, Sam Cole and Don Wibley were leading 10-9 at the tenth end but then let Whitchurch have the upper hand until the final two ends with a late rally of 4 shots but went down 15-20. 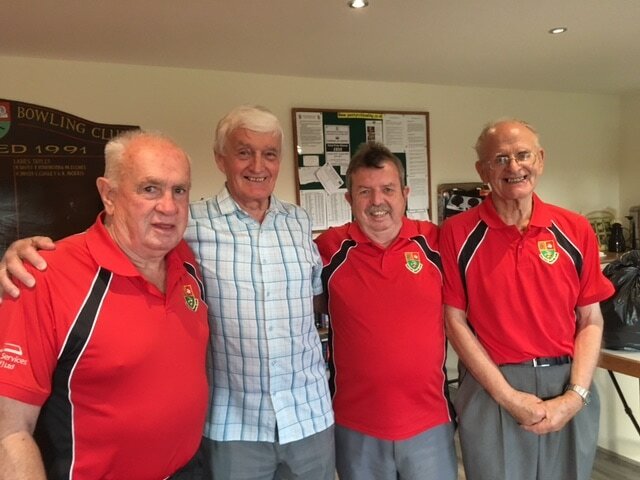 Ian Broxton with Bernie Simpson, Russell Howell and Brian Pearce were the only winners for Pentyrch winning 18-15, closer than Ian would have liked after the flyway start he had. 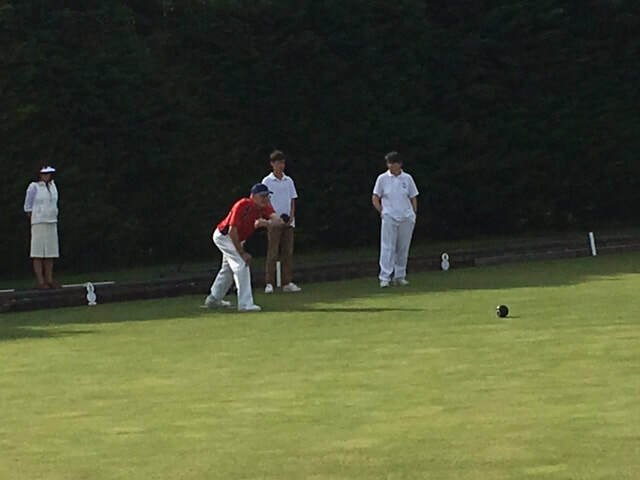 By the fifth end he was 11-1 up and Whitchurch slowly began to catch up getting to 15-17 at the seventeenth end. Well done for hanging on. 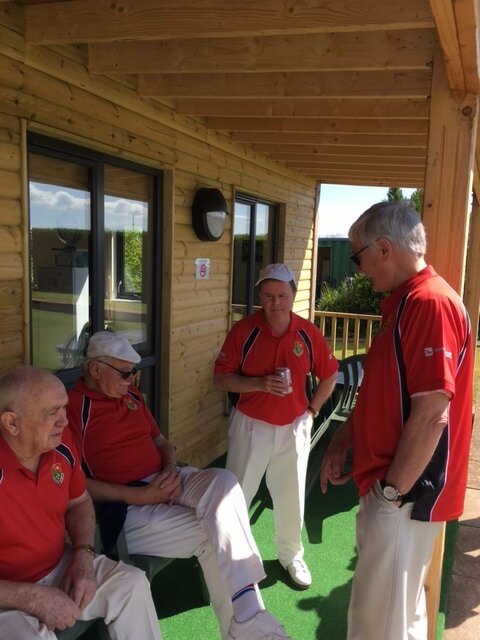 Mark Krawiecki with John Beacham, Keith Capron, John Davies lost 15-23 but the score does not tell the full story. for the first 12 ends this match was close with the lead for each side changing several times. 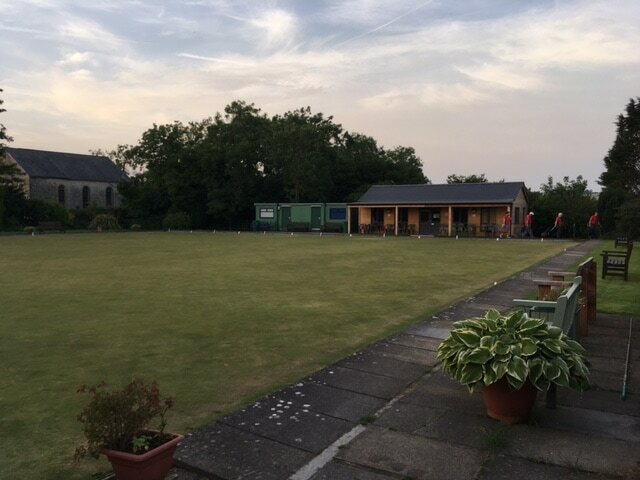 At the 13th end (unlucky for some) the Pentyrch rink scored 3 to level the scores at 13-13 0n the 13th end. At the 14th end with Pentyrch 3 down Mark Krawiecki killed the end. 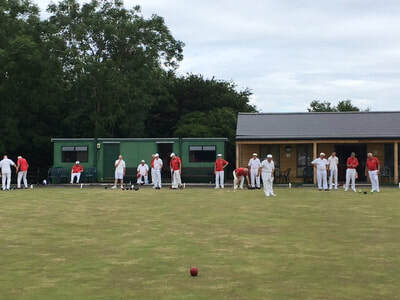 At the replayed 14th end Whitchurch scored a 7, completely out of the blue, a real sucker punch, from which the Tyrchs never recovered, eventually losing by 8 shots. Captains Paul Mitchell and Iain Russell spoke politely about the season drawing to an end and looking forward to next year and Iain reminisced about Whitchurch's welcome for him when he first came to Cardiff in 1987. 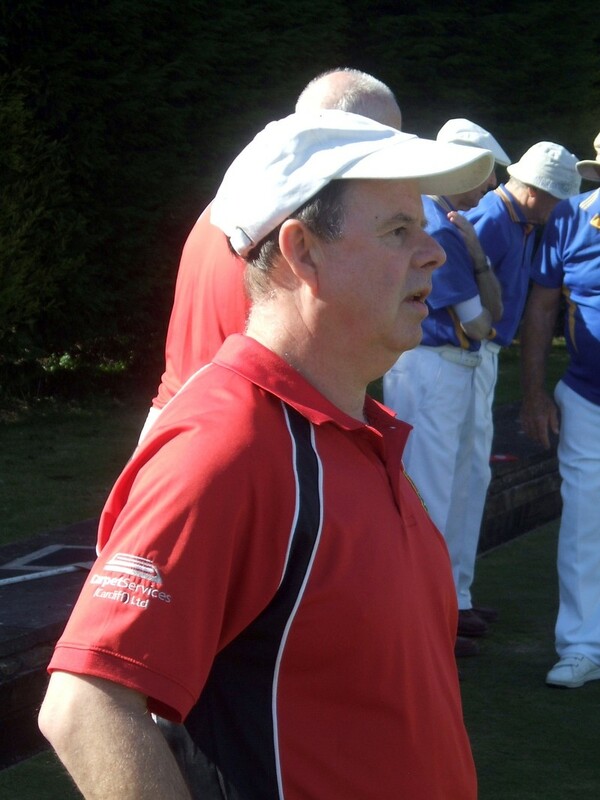 An additional point of interest: Alan Beech played second for Whitchurch against Mark Krawiecki's rink. Alan had represented Wales in the Special Olympics at Sheffield the previous week where he won a gold and silver in the Indoor Bowls. Alan also plays indoor bowls for the Chameleons, based at Sophia Gardens. Well done Alan and all the other Welsh bowlers who won 9 gold, 6 silver and 5 bronze medals between them. 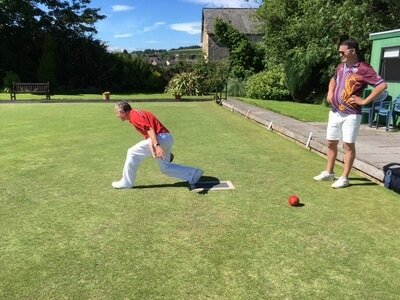 Ian Broxton with Howard Thomas, Sam Cole and Don Wibley lost 10-38. Iain Russell with Keith Capron, Russell Howell and Nick Russell lost 8-21. 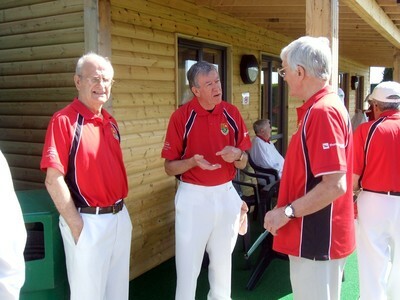 Barrie Thomas with Dave Ashmore, Denzil Thomas and Brian Pearce lost 16-25. 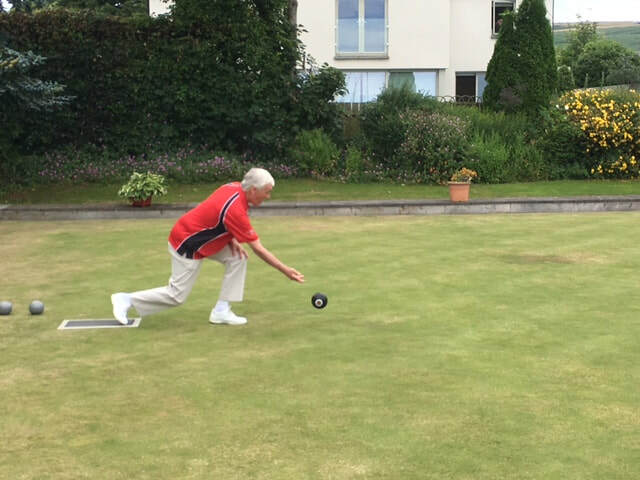 Brian Ilbery skipped the only winning rink with John Berry, Colin Howson and John Davies, winning by 20-16. Next Wednesday an away CMWL fixture at Whitchurch. A win at last! The first win since the 4th of July and very welcome too. 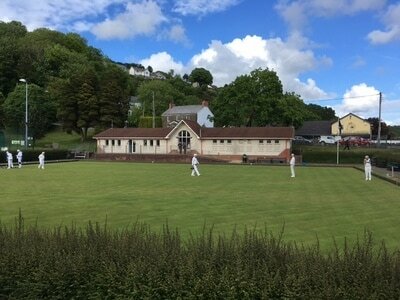 Rhiwbina were the visitors in this home CMWL fixture. 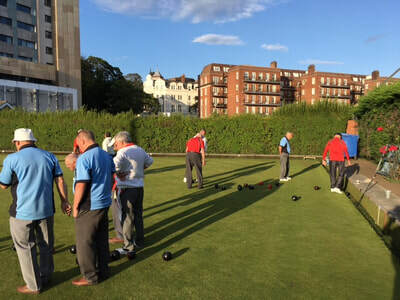 A gloriously sunny afternoon greeted the Tyrchs to a quiet, genteel and leafy section of the seaside town of Penarth that is the home of the magnificent-looking Penarth Windsor Bowling Club. 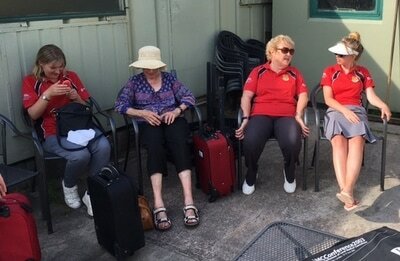 The warm sun that had encouraged some Penarth players to wear "seasonal" shorts was, however, tempered by a mischievously swirling West wind that removed sun hats, ruffled toupees and even interfered with some woods delivered into the headwind towards the neighbouring tennis courts. The visitors were also disconcerted, at first, by a slower pace of green to which they are accustomed. 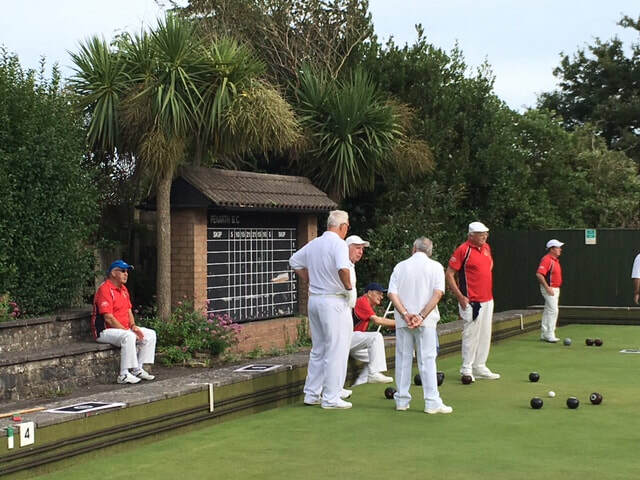 No excuses, however, as the final result showed that Penarth were the stronger team, although around halfway through, the width of the margin of victory for Penarth would not have been predicted to have been as wide as it turned out to be. 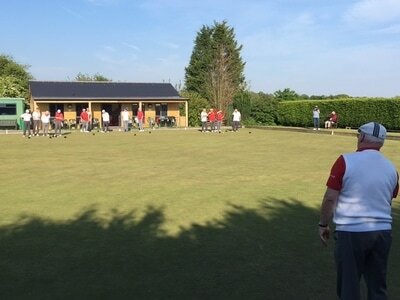 So to the rink scores: Mark Krawiecki's rink with Keith Davies, Russell Howell and Bernie Simpson never enjoyed a lead and revised their initial game target of winning well, to getting double figures, which they managed in the final end, losing 10-27 to the evergreen Ken McLeod and his rink. 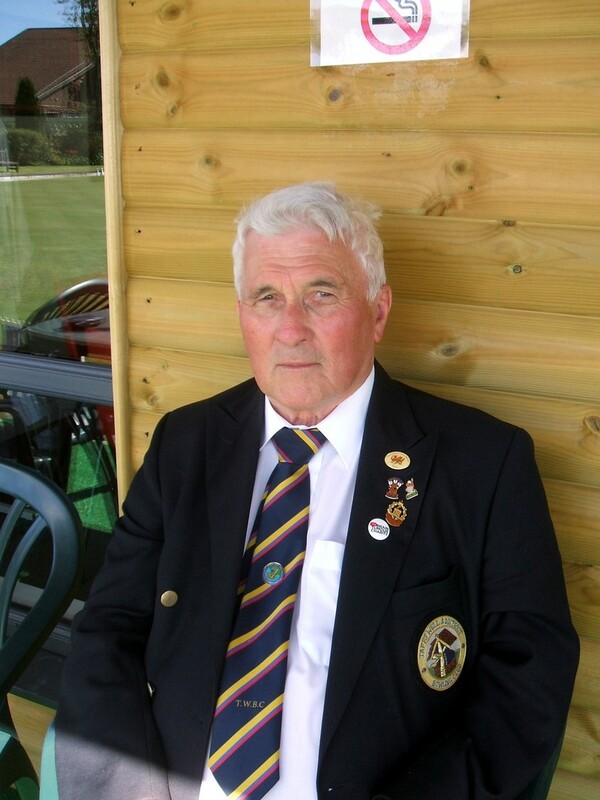 Quote of the day came from Russell Howell, who on seeing Mark Krawiecki and Keith Davies meticulously considering on what shot to play to get out of another perilous situation, advised "Just hit sh** out of it!" This Mark Krawiecki did with a successful outcome. 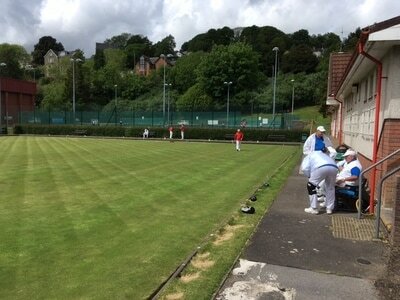 Ian Broxton's rink with Peter Neville, Peter Mynett and Howard Thomas suffered a similar fate as the previous rink: never in it, losing 13-29 to Penarth Captain Matthew Woodcock's rink. 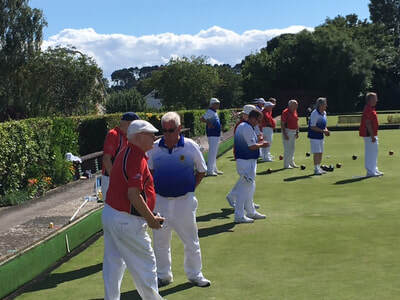 Iain Russell's rink with Barrie Thomas, Don Wibley and Brian Pearce trailed 4-10 at the ninth end, fought back to take the lead 12-11 at the 14th end only to wilt disappointingly to an eventual 13-25 loss. 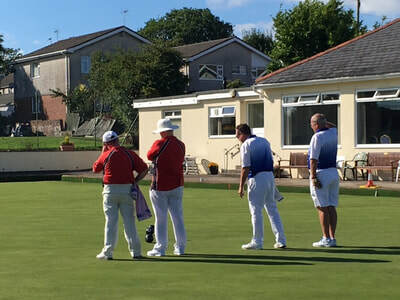 Brain Ilbery's rink with John Davies, Colin Howson and John Beacham was the only rink in contention during the afternoon finally losing 18-22 against the Penarth rink skipped by the ironically named Close. 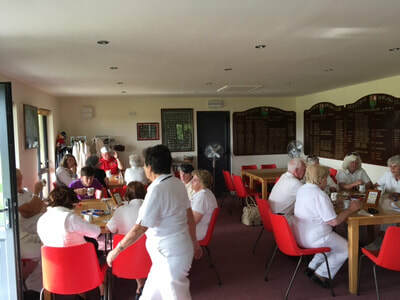 A magnificent buffet was pleasant but small consolation for the result on the green. It looks unlikely that the clubs will meet next season because Penarth look certainties to be promoted to division 2 next season. The opposing captains wished each other well with Mark Krawiecki helpfully adding that if Penarth are unlucky in division 2 next year and were relegated, then the two clubs may meet in two years' time. Nature footnote: the headline refers to the fact that on two previous visits the green has been invaded by swarms of flying ants that have attracted hordes of screeching seagulls. 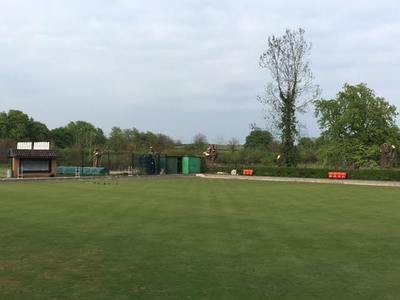 Today there were no flying ants, although the likely presence ants was heralded by the "yaffle" of a green woodpecker, a bird known for its predilection for ants, flitting through the trees at the next door tennis club. A soggy evening in Cardiff city centre for this CMWL fixture at Cardiff Athletic, played in the shadow of Cardiff Blues' stadium and its bigger Principality Stadijum brother. The weather forecast for the day had predicted heavy rain during the day, giving way to drier weather in the evening - in fact, the opposite happened. It was just spitting as we took to the green at 10 to 6 and within minutes the rain steadily increased. 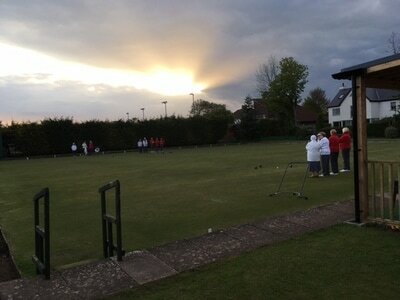 Not a pleasant evening for bowls and in the end honours were even at 57 shots each and 2 rinks won for each team. 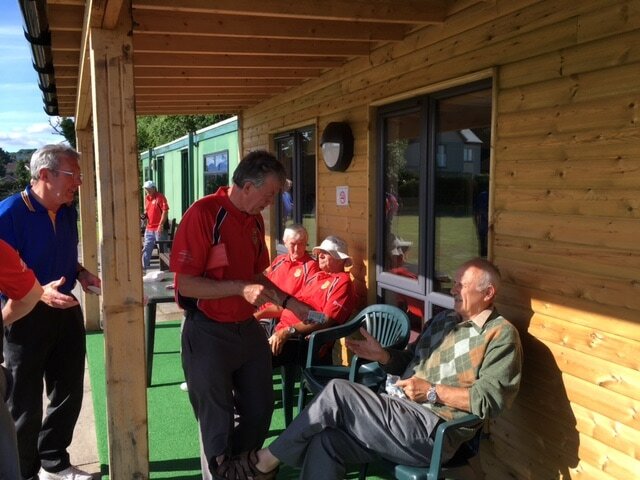 The players were happy to get out of the rain and enjoy the great refreshments and drinks provided by our hosts. We meet again at the end of the month in a PG1 fixture. 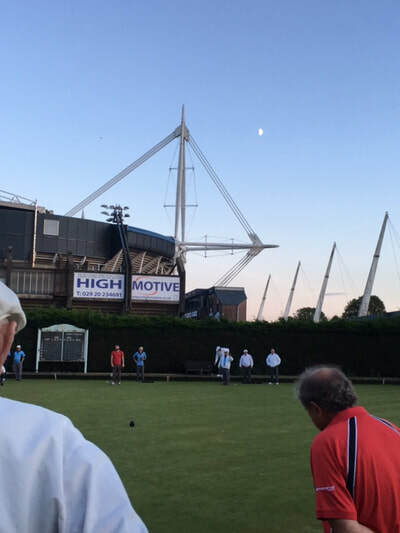 A heavy home defeat to Cardiff Athletic in the PG1 competition. 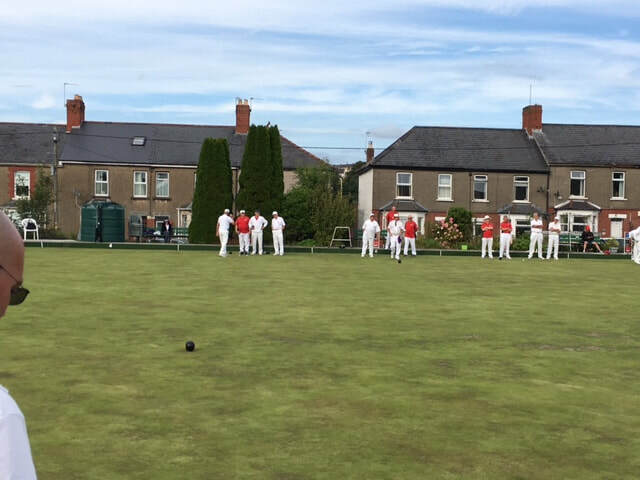 The one winning Pentyrch rink was skipped by Brain Ilbery winning 21-15. 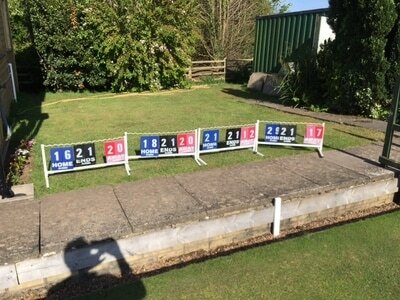 John Berry lost 12-28, Ian Broxton 13-29 and Iain Russell 11-31. 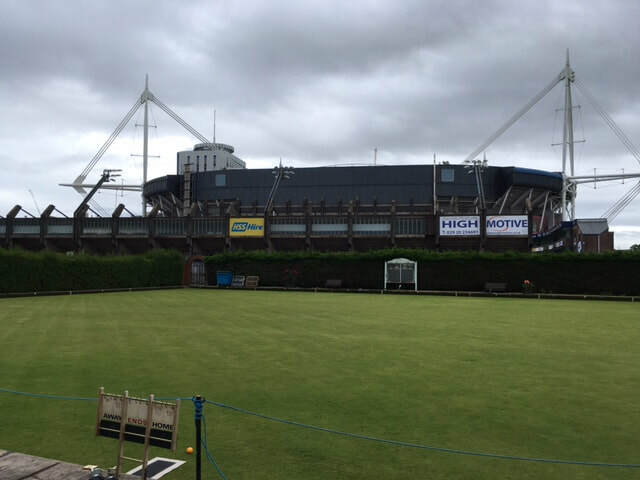 We meet Cardiff Athletic away next Wednesday - weather permitting. Two defeats in five days to the Mackintosh. This time in an away CMWL fixture. Iain Russell's rink lost heavily 8-20. 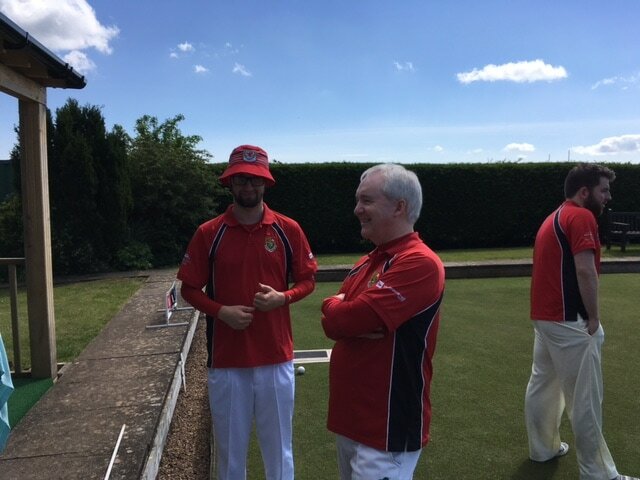 Brain Ilbery lost 13-20 and John Berry 14-20. Ian Broxton's rink flew the flag again against the Mack, winning 17-8. A close result in this away PG1 fixture at the Mackintosh. Ian Broxton skipped the only winning rink. Brian Ilbery's and John Berry's rinks both lost by 4 shots and Iain Russell's rink lost by 6. 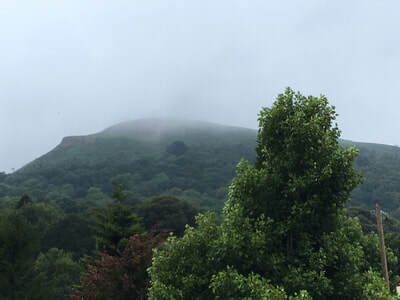 The magnificent Garth mountain that dominates the skyline above Taffs Well, intermittently shrouded with swirling mist, was a portent of what lay in store for the Tyrchs for the second meeting with the Wellmen in July. 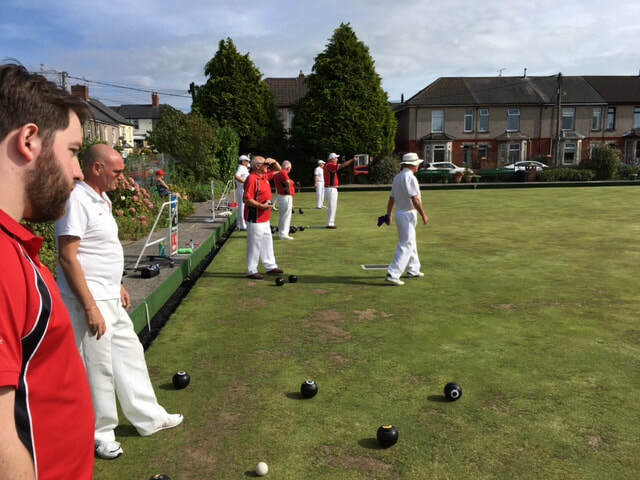 At the beginning of the month, in the glorious sunshine of home, the Tyrchs prevailed, this evening it was the turn of Tafffs Well to win. 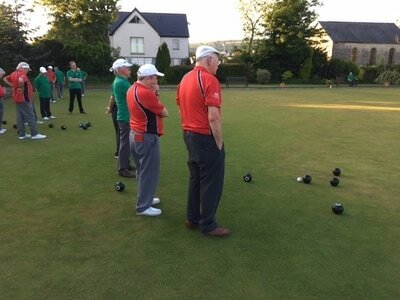 The score in rinks won was two apiece but a heavy defeat for Iain Russell meant that the aggregate score favoured the home side. 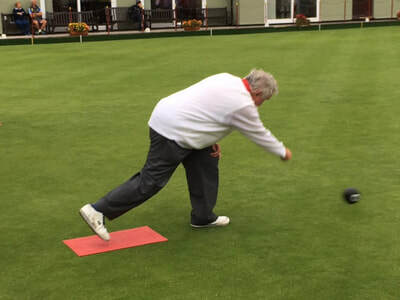 A very heavy playing surface made the game difficult for many of the visitors who have become accustomed to a much faster green at home for the last 6 out of seven fixtures. Iain's rink with Dave Hughes, Don Wibley and Dave Ashmore never came close losing 6-28. 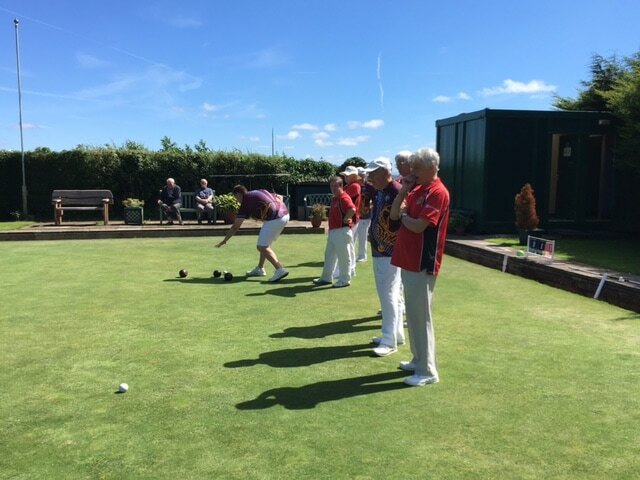 Mark Krawiecki with Nick Russell, Brain Pearce and John Eagle led against Ian Best's rink until dropping 5 at the 15th end: too late to recover losing 12-17. 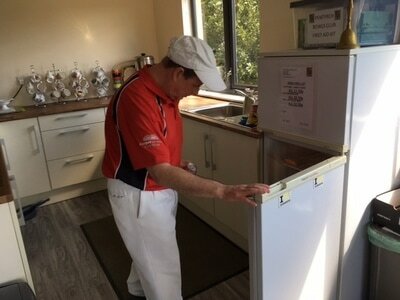 Brian Ilbery, John Berry, Alan Lowndes and Jeff Tarr were 6-14 down at the 13th end, then recovered strongly scoring 12 to 1 in the last 5 ends, winning 18-15. 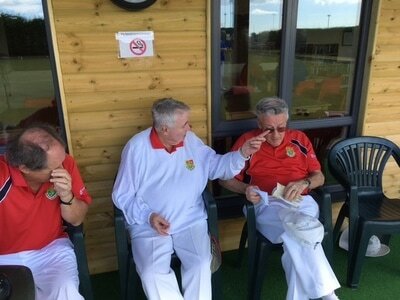 Ian Broxton, Barrie Thomas, Peter Neville and Russell Howell kept their noses in front for most of their match winning 15-12. 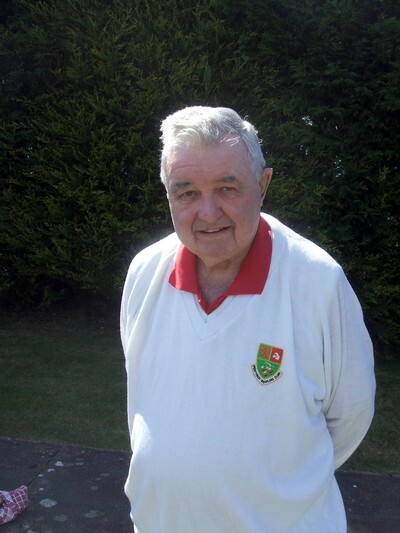 A happy result, especially for Barrie Thomas, who now has a hat-trick of wins against Taffs Well this season. If you look carefully, you can see Barrie already celebrating 4 ends before the end of the match! A convincing win by Pontyclun in this home PG1 fixture against Pontyclun who had already beaten the Tyrchs in May in the Carruthers Shield. A gloomy, damp and miserable afternoon more akin to weather in October provided the backdrop and mood for the Pentyrch team. "Best" losing rink was skipped by Mark Krawiecki, losing 14-19. Iain Russell's rink lost 16-22. 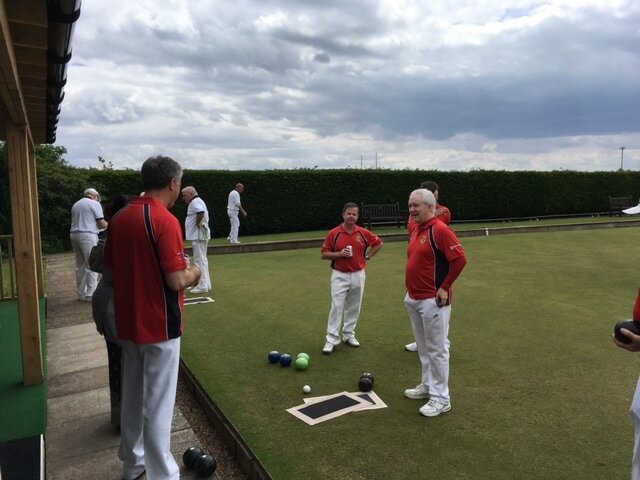 Brian Ilbery's rink went down 16-25 with Ian Broxton's rink losing 16-25. 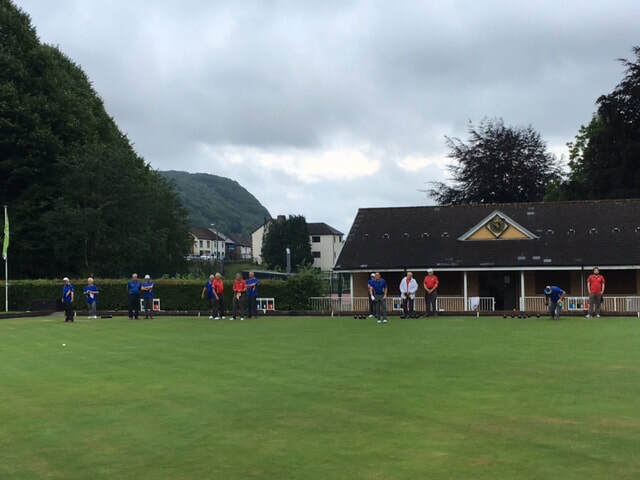 Three away fixtures now follow in seven days - Taffs Well on Wednesday, Rhiwbina on Thursday and Mackintosh next Saturday. 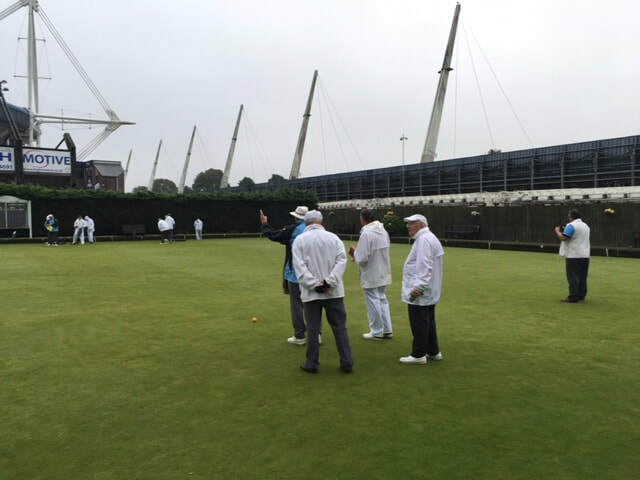 Another re-arranged fixture caused by the rain from earlier in the season. This time Penarth Windsor were the visitors and proved worthy winners by 84 shots to 49 in the PG1 fixture. Pentyrch managed one winning rink. 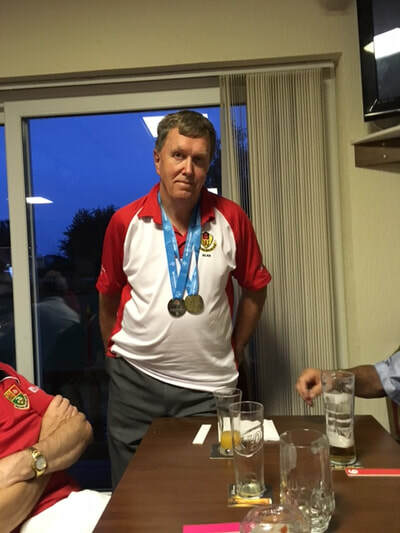 Thanks to Ian Broxton former captain for standing in as captain for the evening. Following two successive defeats, the Trychs were hoping that things may get better at Whitchurch Hospital, but it wasn't to be. 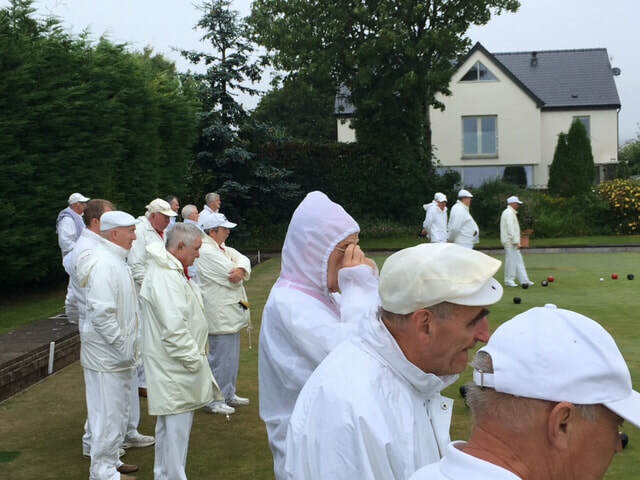 The heavy rain of the day before meant a heavier green than recent matches and it took a while for the visitors to get accustomed to the slower pace. 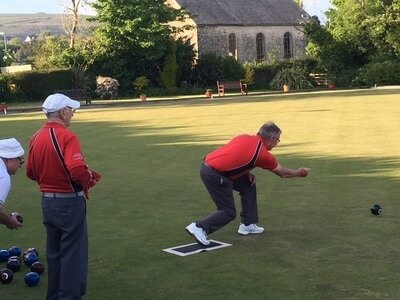 Iain Russell stood in as captain for the evening and led the way with his rink being the only winning rink for Pentyrch by two shots. The rinks of Dave Hughes, Ian Broxton and Peter Neville all succumbing to their opponents. 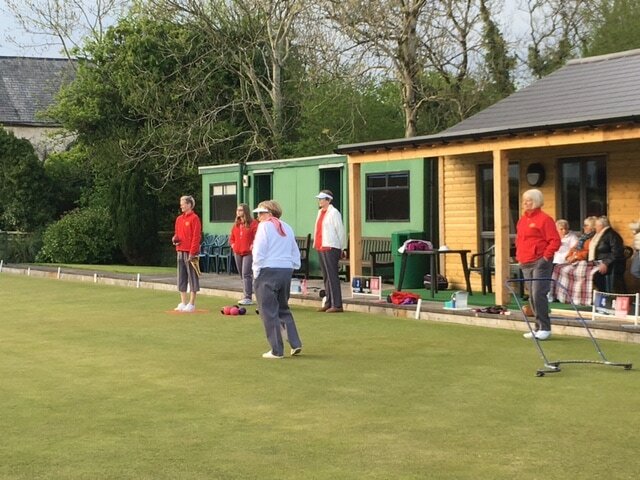 Once again, because of postponed matches from earlier in the season, Pentyrch have a chance to get back to winning tomorrow evening at home to Penarth Windsor in a rearranged PG1 encounter. 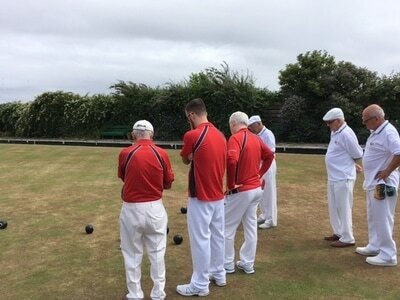 The margins in sport between winning and losing can be very fine in sport, and so it proved to be today in our home PG1 fixture against the seasiders from Penarth. 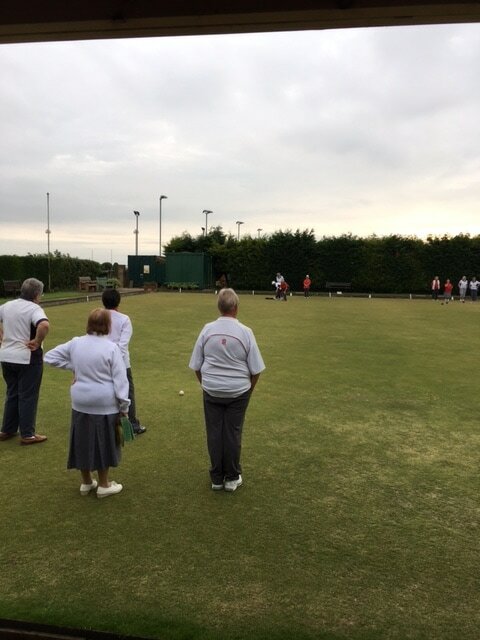 The home side eventually lost by one shot, although the visitors won 3 of the 4 rinks. The parched green that was hosting its third match in a week was very fast with weight control crucial to getting good results.Brian Ilbery with John Berry, Don Wibley and Jon Tyler had the better of their opponents being ahead 19-13 at the 17th end, then losing 9 shots in the last 4 ends, losing 19-22. Mark Krawiecki, Barrie Thomas, Russell Howell and John Beacham struggled to such an extent that they were behind 5-18 at the 15th end. They then scored 11 unanswered shots, running out of ends to lose 16-18. Iain Russell, Dave Hughes, Peter Mynett and Colin Jackson were never really in their match, going down 16-30. 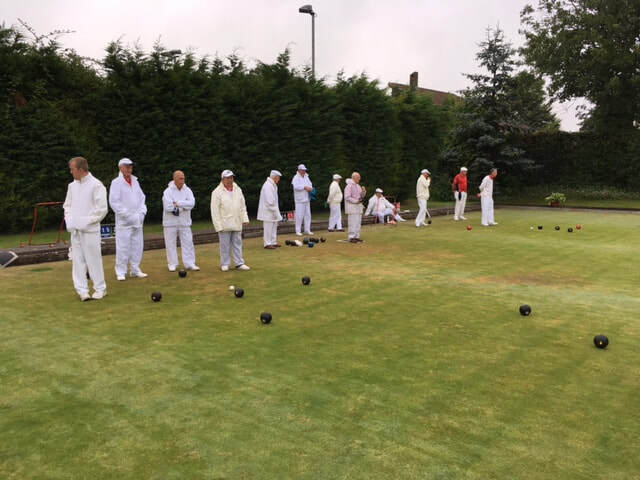 The heroics of the afternoon came from Iain Broxton's rink with Peter Neville, Brian Pearce and Howard Thomas who won convincingly 27-9. At the last end with the overall match result within their grasp and only needing one shot to draw they moved the jack 3 times but not quite enough... so Penarth took the spoils. "What a difference a day makes" as sung by Dinah Washington, Dean Martin and others, the song reflects the difference in fortunes of the Tyrchs in 24 little hours, although in the opposite way to the lyrics in the song - from joy to sorrow. Defeat to Cardiff, although bitter after the previous evening's win over Taffs Well, was only by 9 shots overall. 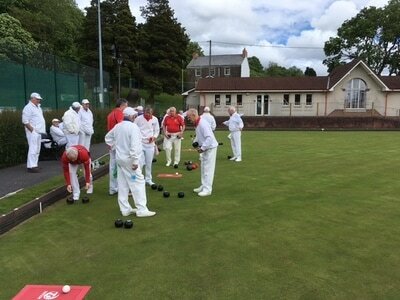 The fortunes of the Pentyrch rinks were highly polarised. 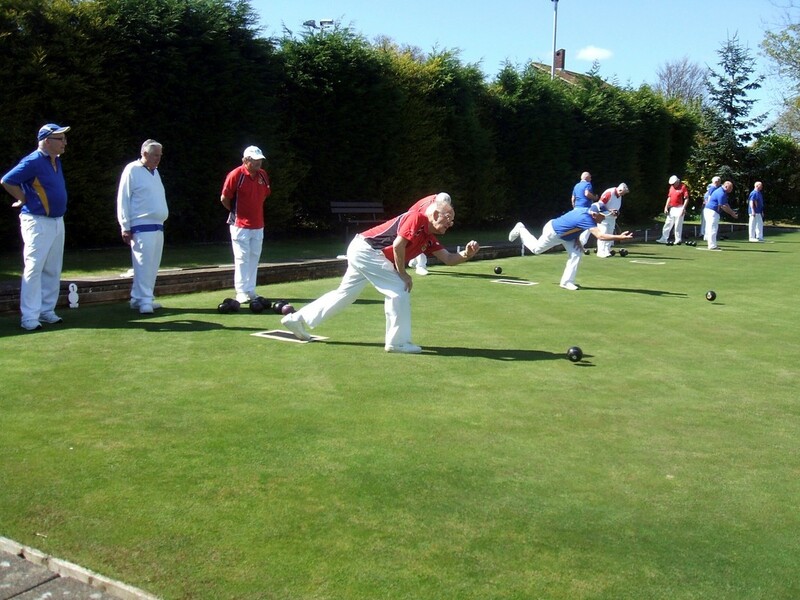 Iain Russell's rink were never in the match losing 8-19 and a similar pattern for Ian Broxton's rink who went down 7-25. 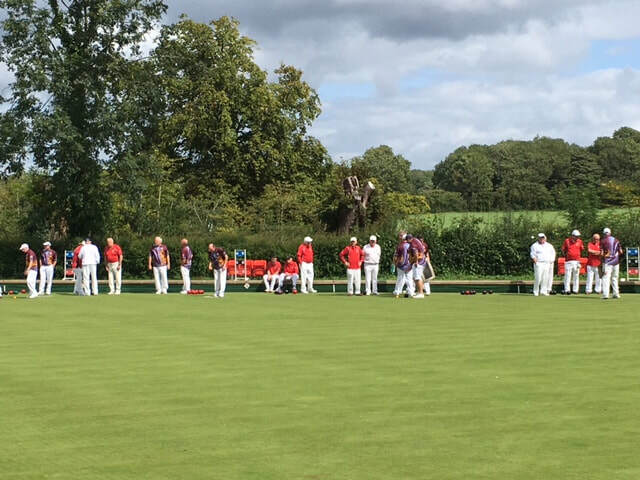 In Contrast Brian Ilbery's rink were always ahead eventually winning 17-10. 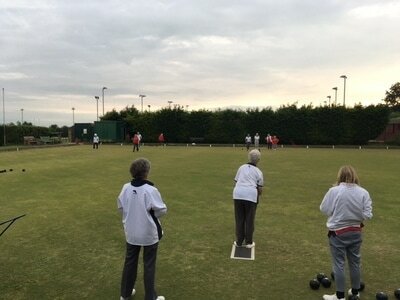 Mark Krawiecki's rink mastered rink 1 winning 25-12, although a careless last wood giving away 4, by Mark Krawiecki took the shine off a good performance highlighted by some consistently excellent bowling by Nick Russell. 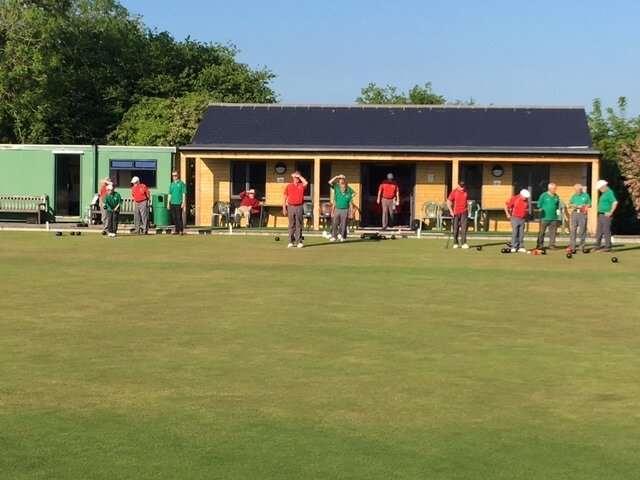 A rearranged CMWL fixture on a gloriously sunny summer's evening saw the Tyrchs take a well-earned victory over local rivals and friends from Taffs Well, winning by 11 shots. Two rinks winning and the two losing rinks, only losing by 2 shots each. Well done Pentyrch! Ian Broxton's rink with Howard Thomas, Russell Howell and Dave Hughes led all the way through getting to 14-6 in the 12th end, then took their collective foot off the gas, holding on for a 15-12 win. 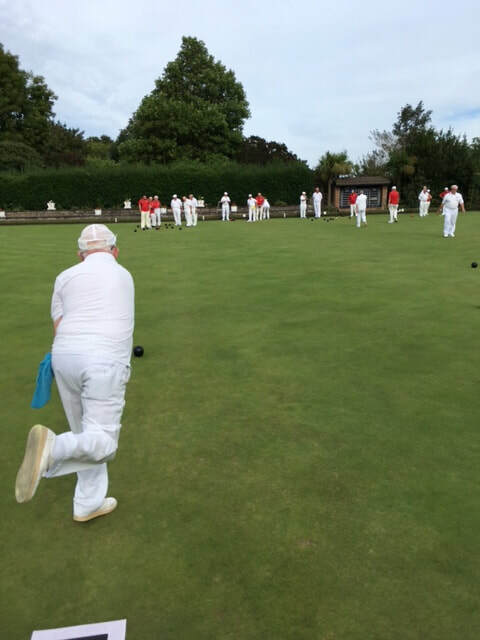 The other winning rink, skipped by Barrie Thomas, very well backed up by John Eagle, Peter Mynett and Peter Neville were in strong control all the way through winning convincingly 21-9. A particularly sweet win for Barrie. Brain Ilbery's rink, including John Beacham, Alan Lowndes and John Berry were involved in a "game of two halves", building up an incredible 10-0 after 6 ends that had people looking at the scoreboard twice and pinching themselves. 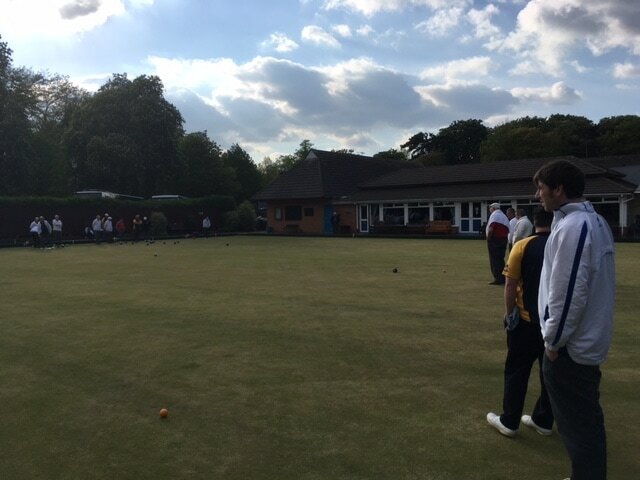 However, the opposition replied well eventually winning 17-15. Mark Krawiecki's rink with Jeff Tarr, Sam Cole and Bryn Owen (super-sub), rather harshly in the context of the night's win ended up doing the washing-up duties for losing 11-13. 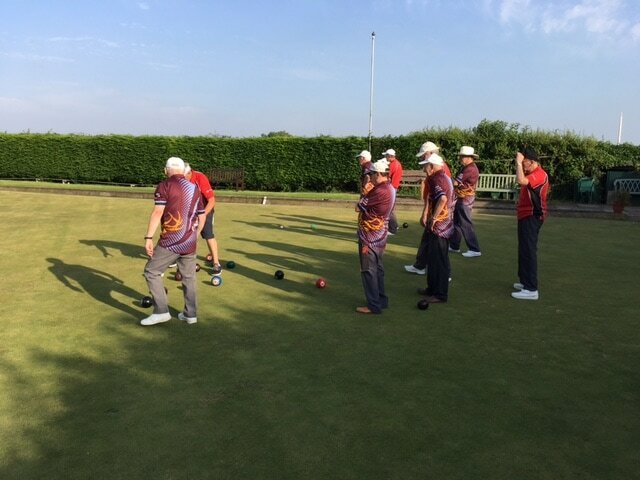 A very tight game with no more than 2 shots difference at any time, the Tyrchs went into the final end with a one shot lead, unfortunately losing a 3 at the last end. Mark Krawiecki, Pentyrch Captain alluded to the great spirit of rivalry yet comradeship that the match had been played in and this was echoed by Taffs Well Captain, Lance Timothy who graciously acknowledged Pentyrch's victory. 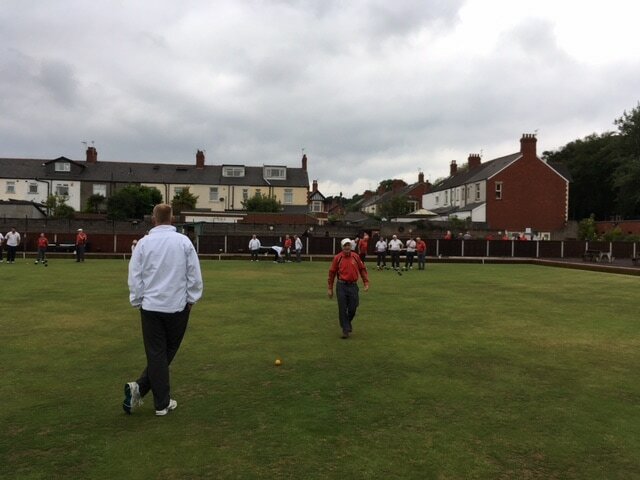 Further meetings to come, including the Garth Cup in September when the Wellmen will be keenly looking for revenge. 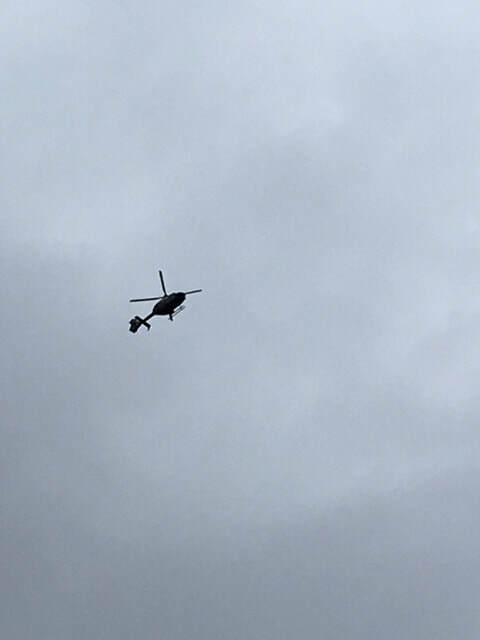 Last week at Sully we were greeted by buzzing remote-controlled WW2 replica aircraft, today there was a fly past by a bi-plane and some other unknown single propellor plane heading for a nearby airshow, like metaphoric vultures circling overhead - on omen of doom and disaster? Who knows, but those of superstitious minds may feel there's something in it? This PG1 match was the third meeting of the two local teams this season and the third victory for St Fagans with each match the difference growing larger. The first match of the season the Tyrchs lost by only 9 shots, less than 2 weeks ago the difference was 35 and today 38. As captain Mark Krawiecki said after the match, Pentyrch would be looking to redress the balance in the final meeting of the season on the 19th August. All 4 home rinks lost. Dave Hughes's rink lost 27-11 being behind all the way through the match. 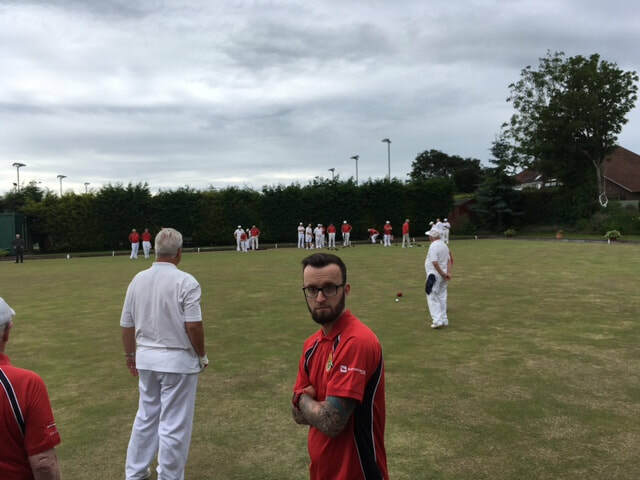 Iain Russell's rink, the most settled for the season to date, began very optimistically with a 9-0 lead after 5 ends, losing 16-23. A 6 and 4 by the opposition at the 11th and 13th ends turned the match around and the Tyrchs did not recover. Mark Krawiecki's rink gave a the opponents a 5-0 start after 2 ends and were playing catch-up for the rest of the match and never did, losing 23-14. Brian Ilbery's rink came closest losing 19-25. 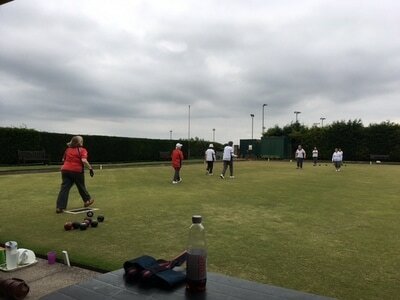 Starting badly: 0-6 down after 3 ends , by the 15th end they were winning 18-14 but from then on losing all but the last end. 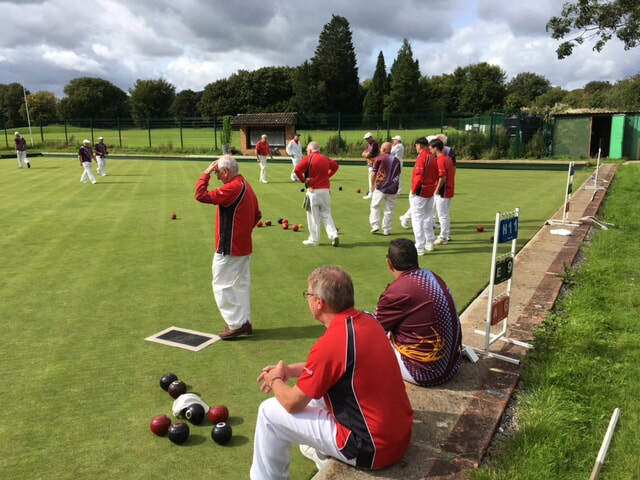 A busy week follows with home games on Tuesday, Wednesday and Saturday and a mixed friendly match in Gloucester next Sunday. 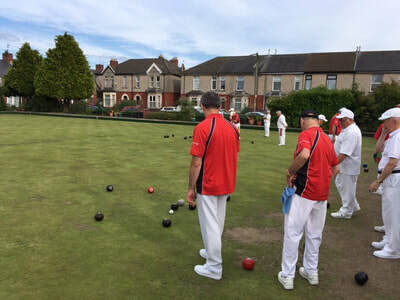 A second defeat to Penylan in this Cardiff midweek fixture, although an improvement on the home match result way back in April. 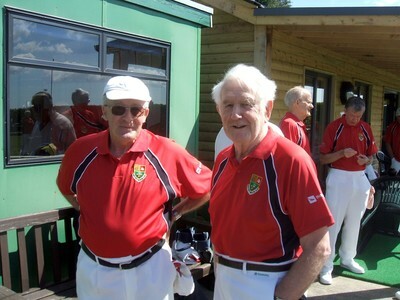 The overall deficit was decreased by 5 shots and Pentyrch had a winning rink skipped by Barrie Thomas. 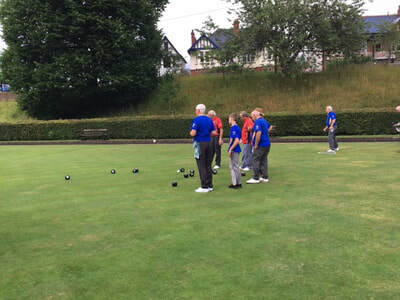 As is so often the case at Penylan, the visitors were overwhelmed by superior opponents but still made brave efforts to rise to the challenge. 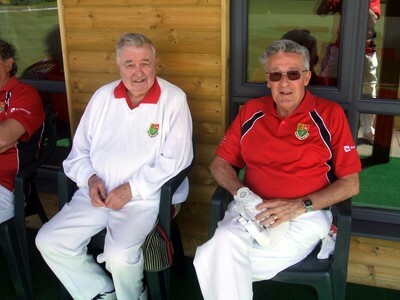 Thanks must go to John Beacham who travelled all the way from Dowlais batting against heavy rush-hour traffic. The rink of Barrie Thomas with Peter Neville, Bryn Own (making a very welcome return) and Dave Ashmore had a great team performance winning 20-13 - no mean feat. Dave Hughes's rink lost 23-7, Brian Ilbery 23-6 and Mark Krawiecki's rink brought up the rear going down 27-7. 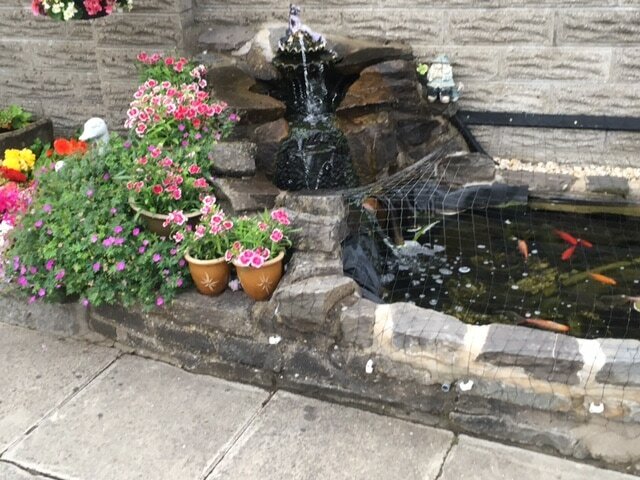 The small water feature with gentle waterfall and goldfish, perhaps as a calming influence did not help with providing any peace or comfort. Great hospitality and post-match food provided some consolation. We'll try again next year. 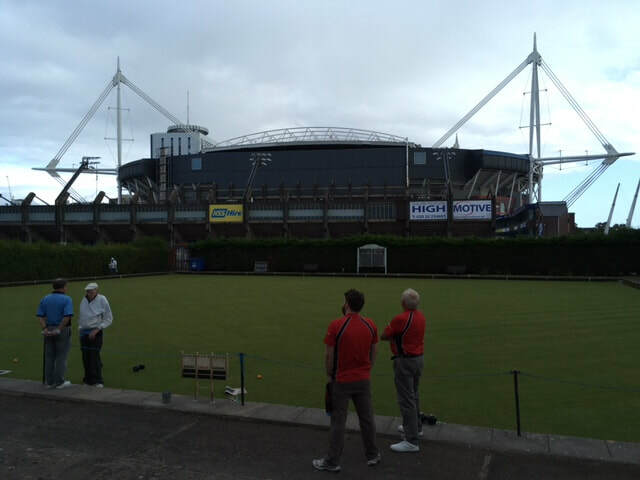 Pentyrch Ladies lost at home, both rinks going down to the Ladies of Sophia Gardens. 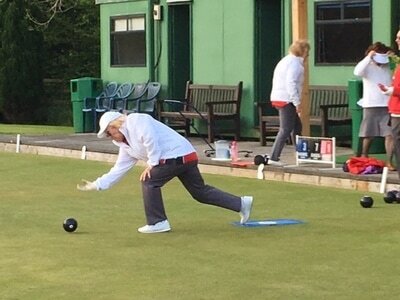 Eileen Boddington's rink fought hard losing only by three shots. Jan Berry's rink lost more convincingly against a strong Cardiff rink. Today was Armed Forces Day and as part of the celebrations a sadly, very poorly attended event was taking place on the rugby field immediately behind the bowling green. The Trychs were greeted by several remote controlled WW2 replica aircraft angrily buzzing around and to a very enthusiastic band (with a good guitarist) blasting out their sounds towards Penarth from the back of an articulated trailer (see pics). 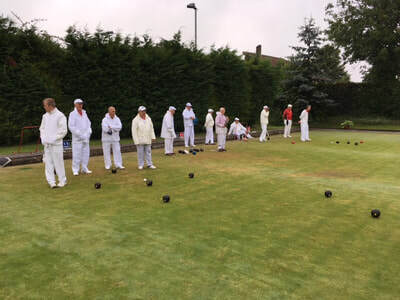 The whole match was accompanied to a mix of tribute songs played by the band, some big band nostalgia from the '30's and '40's and, bizarrely, some Disco hits from the '70's. The music occasionally inspired some of the players but also prevented some from concentrating on the reason they had turned up to play. So, onto the bowls - an improvement on the corresponding fixture last year, when the visitors conceded 105 shots but not in terms of the overall result, with the home team winning all 4 rinks. 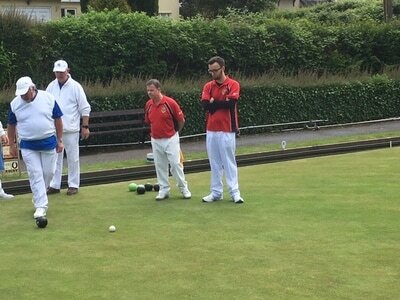 Iain Russell's rink of Barrie Thomas, Denzil Thomas and John Tyler were the best losers; 19-16 having at various stages been 9-2 and 12-6 down. Keith Davies back at skip with John Berry, Russell Howell and Howard Thomas recovered from 16-4 at the eighth end to lose 25-19. 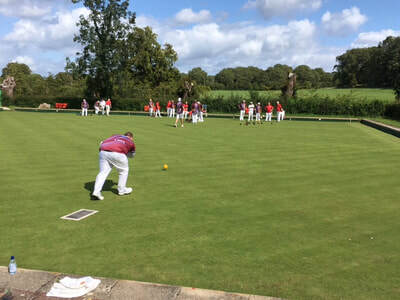 Mark Krawiecki's rink with Peter Neville, John Eagle and John Beacham struggled to get any consistency, getting as close as 15-12 down at the 13th end, going on to concede all but one of the last ends, losing 24-13. Ian Broxton with Don Wibley, Peter Mynett and Dave Ashmore were never in their match, although showed a "never-give-up" attitude from 23-4 down at the 12th end to go down 26-13. Almost a game of two halves. As ever, a magnificent meal after the match - a fittingly nostalgic choice of ham salad with boiled potatoes - and an old favourite of traditional match day teas. 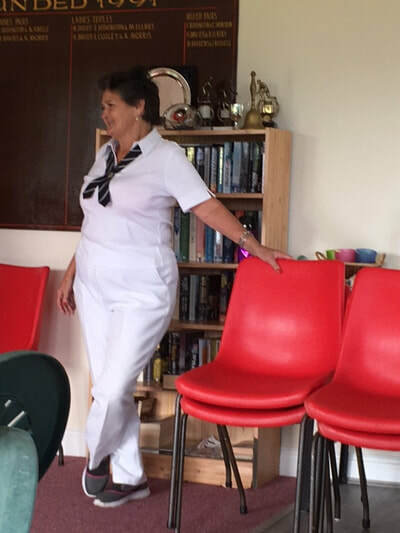 Unfortunately, accompanied by the caterwauling of a local resident who thought she could sing "Sweet Caroline". 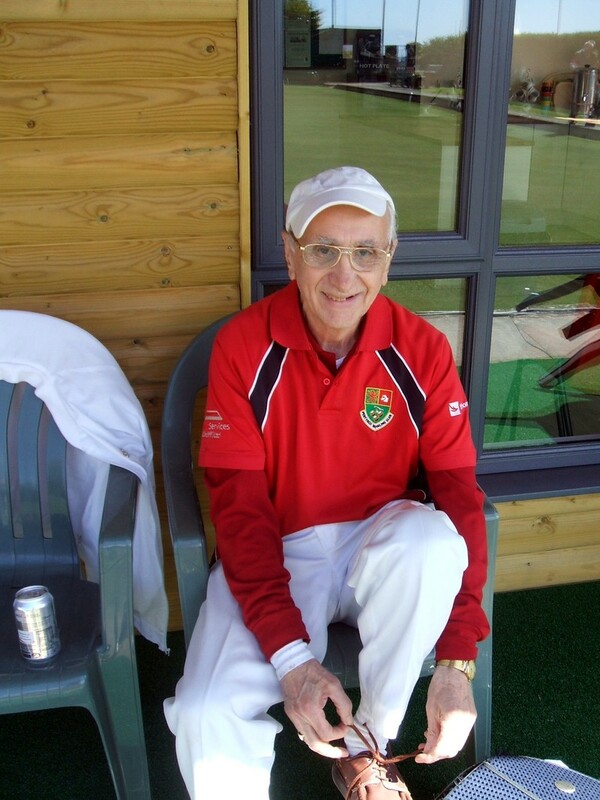 *It was great to see Bryn Owen supporting the team from the side. Another hot and sultry day as temperature records were beaten across Wales and the UK, on the longest day of the year, a St Fagans team added to the heat against the Tyrchs. The away team won convincingly in the end 79-44. 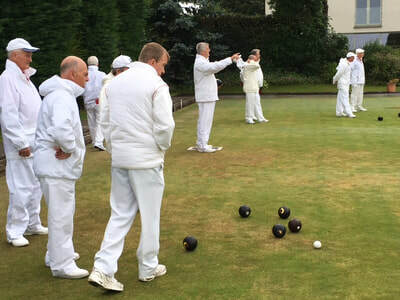 Iain Russell's rink lost 10-13 with the lowest losing margin. Mark Krawiecki's rink fought hard, eventually losing 14-19. 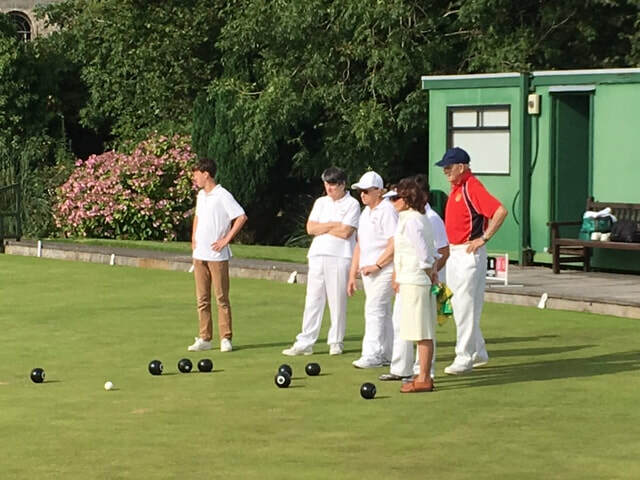 The opposing rink included a nine-year old boy who played really well - so inspiring to see young talent being encouraged to take part in our great sport. 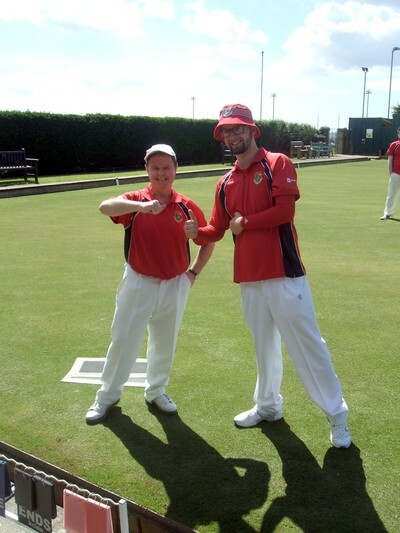 Brian Ilbery's rink lost 9-19 and Ian Broxton's rink lost 11-28. 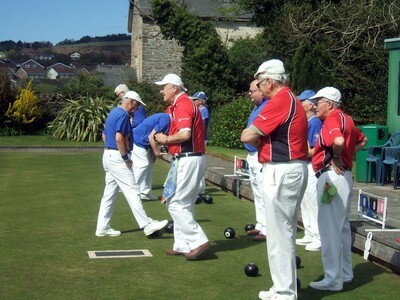 The weather will cool down in the coming days and the Tyrchs will look to put things right at Sully by the seaside on Saturday. The last picture below shows the green after the match on the evening of the longest day. 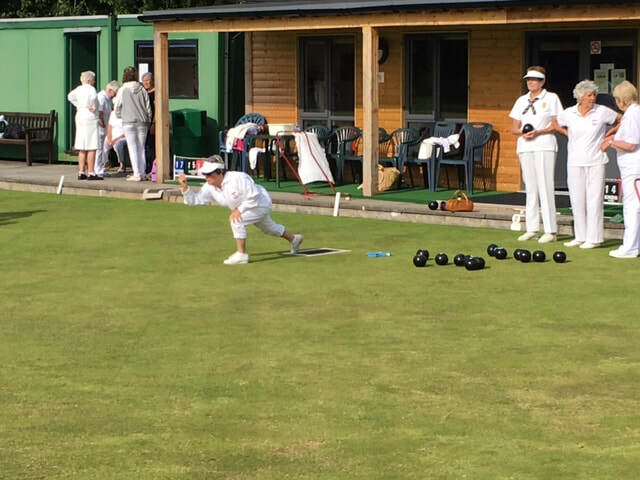 On a day and evening that were the hottest of the year so far, Whitchurch Ladies also turned up the heat against Pentyrch proving to be too strong for the Tyrchs. However, not all was doom and gloom as Anne Lowndes and Anna-Marie Krawiecka made their debuts for Pentyrch. Thanks to Margaret Ellmes for her continued support too. The Walker Brothers sang about losing "That Loving Feeling" all those years ago and the Tyrchs rediscovered that "Winning Feeling" against Whitchurch at home in the Cardiff Midweek League. It was the first win for the club since May 24th, so a notable occasion. Mark Krawiecki stood in as captain for the evening and led the way with the highest winning rink of the evening, with a convincing 24-8 very ably supported by Nick Russell, Cyril Ellmes and Jeff Tarr. 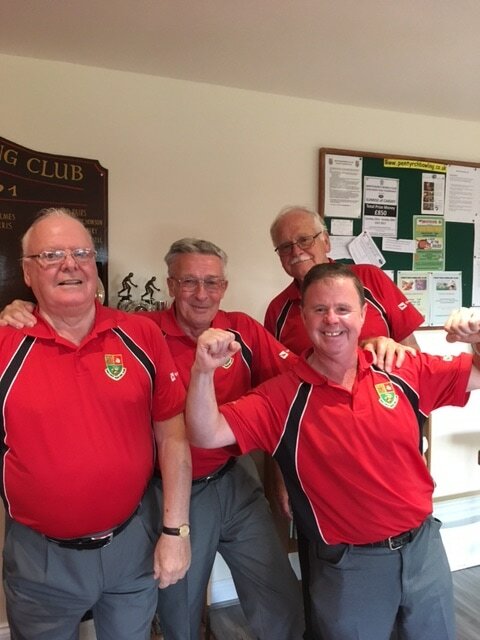 Ian Broxton was the other victorious Pentyrch skip with Barrie Thomas, Peter Mynett and Dave Ashmore, winning 25-11. Dave Hughes's rink which included Don Wibley,Denzil Thomas and John Tyler came very close going down 17-19. 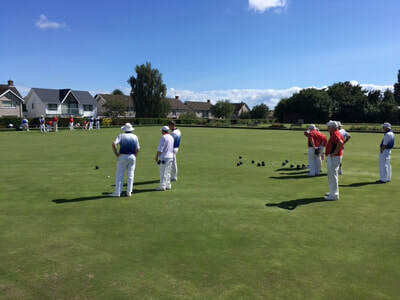 Iain Russell's rink with John Berry,Russell Howell and Sam Cole had a bad evening at the office, losing 8-24 and winning the Marigold award. Overall, it was good for the club to get back to winning ways despite several players being unavailable through ill-health or other commitments. Well done everyone! The Ladies lost 25-37 against a strong Gilfach Bargoed who always prove to be formidable opponents. 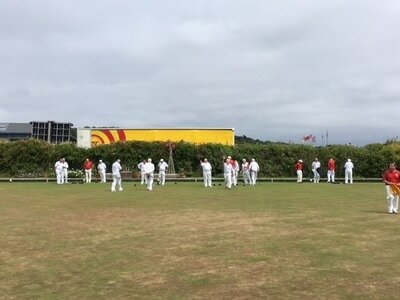 Both rinks lost: one 10-18 and the other, 15-19 but both rinks played well and put up a brave performance. 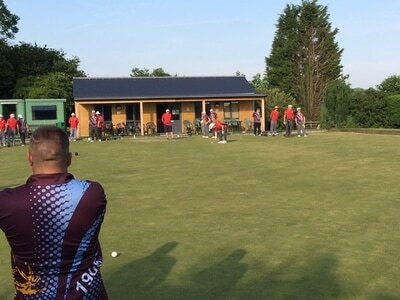 Another big defeat for the Tyrchs - this time at home in the CMWL to Cardiff Athletic. With only a week until the General Election it's a time to recall Tony Blair's and Labour's victory spectacular win in 1997 accompanied to D:Ream's anthemic "Things Can Only Get Better". A tune that Pentyrch could do with adopting.? 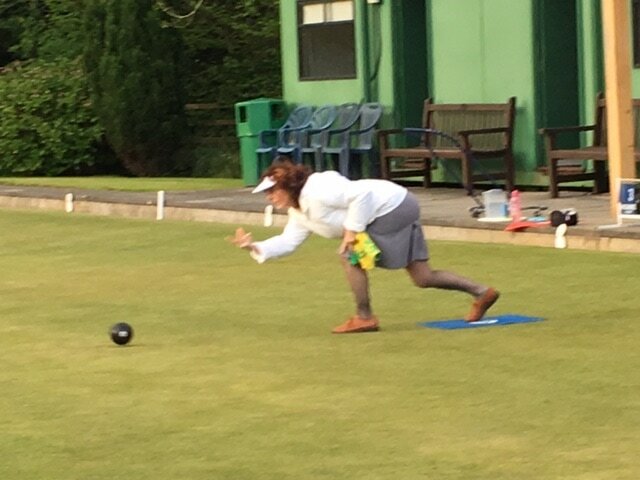 Anyway, with a weekend's tour to Swindon and district coming up, it will be a welcome distraction from competitive bowls. If things don't get better, at least things will be different. 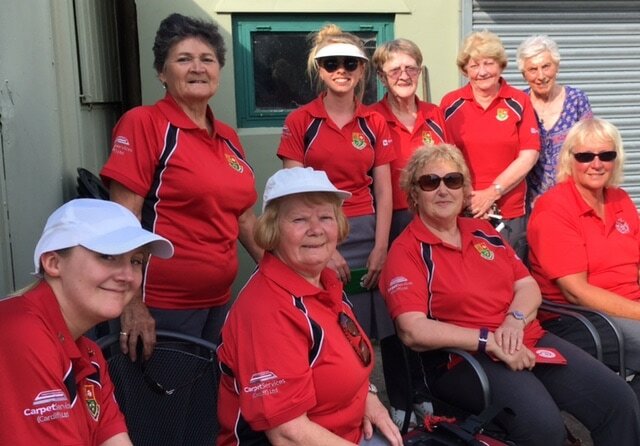 Our involvement in the Carruthers Shield came to a grinding halt with another century of points conceded in the 3rd and, for us, the final game in this year's group stage of the competition. 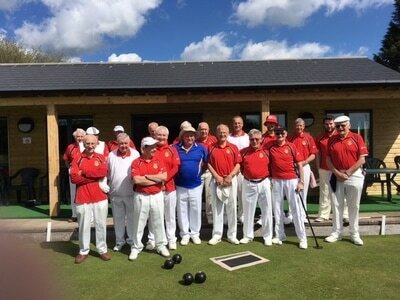 There's always next year and a new group of teams to look forward too... Well done to our opponents from Pontyclun - worthy winners. 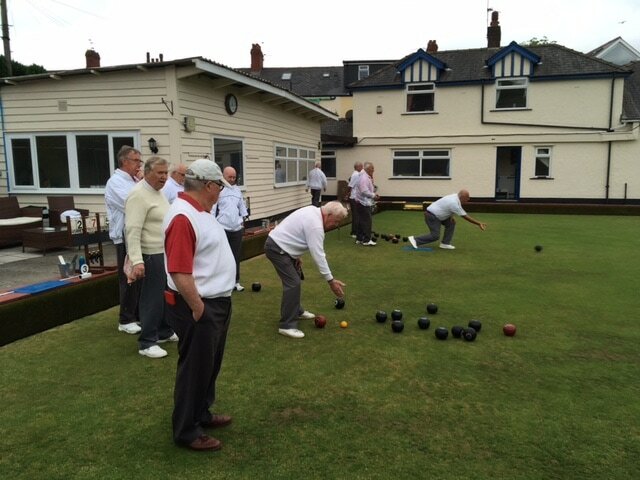 The recent home match v Rhiwbina that was postponed because of rain was rearranged for this Friday evening. Unfortunately Pentyrch had the disadvantage of having to play one triple. The triple rink lost 15 - 17 and the full rink lost 14 - 25. 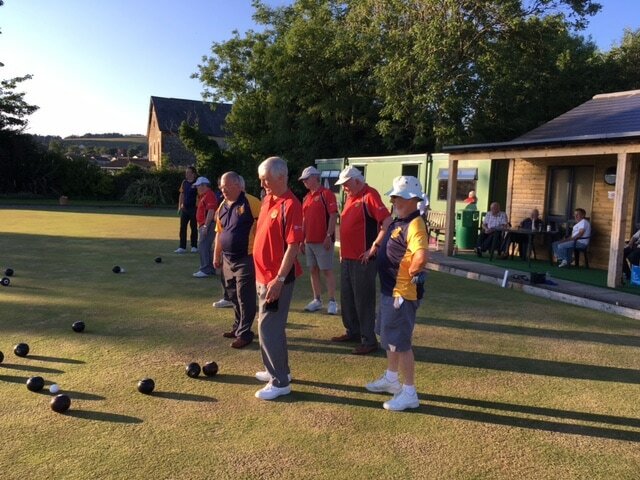 The saying goes that a wounded animal is at its most dangerous when it's wounded and so it proved to be true for the Mackintosh, who came to a gloriously sunny Parc-y-Dwrlyn evening to play a Pentyrch team, badly hurting from the weekend hammering at Llantrisant. The sun made it difficult playing towards the tennis courts and there was no respite until the closing ends, as the sun went down. 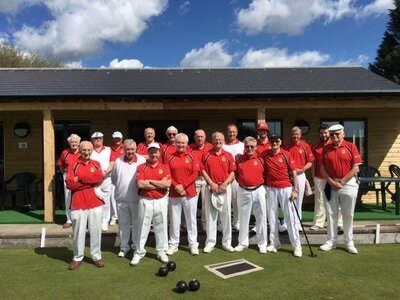 Three rinks won with only Ian Broxton's rink losing 15-23 to visiting captain Brain Pinnell's rink. Iain Russell skipping a complete new line-up for him, won 19-12, scoring 10 unanswered shots in the last 5 ends. 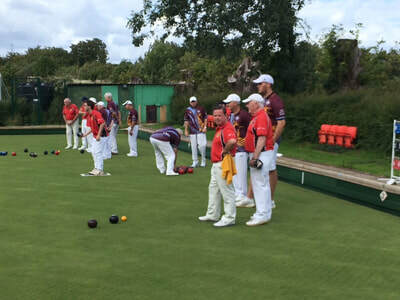 Brian Ilbery's rink won 21-13 with a cherry of a 6 on top at the final end. Most notable win was by Mark Krawiecki's rink with a 37-7 win, a score which included two 6's. 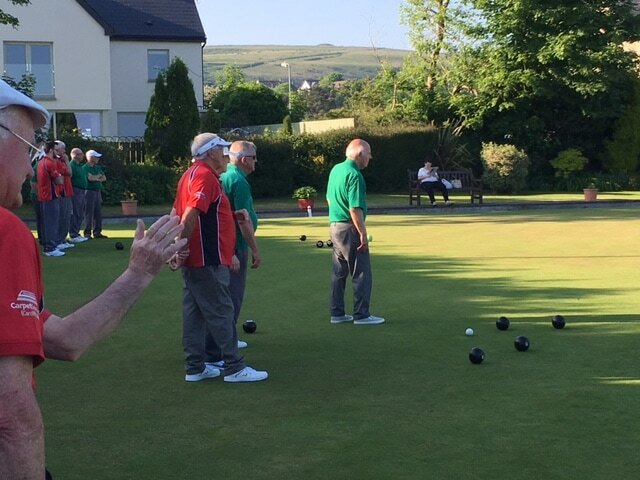 A solid performance by all four players with Barrie Thomas as 3rd, Dave Ashmore 2nd and John Beecham as lead. Well done Tyrchs! 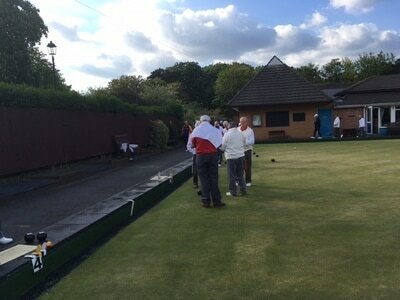 ​A good second home victory over close friends from Mackintosh whom we meet twice in one week at the end of July at their place. A good away win at Llanbradach. One rink winning 17-10 and the other rink losing by the narrowest of socres 16-17. Well done everyone! If we were to extend last week's political analogy of Pentyrch's performance as being "strong and stable", then today's performance was that of a "coalition of chaos". A heavy defeat came at the hands of Llantrisant in the second WBA Carruthers Shield. 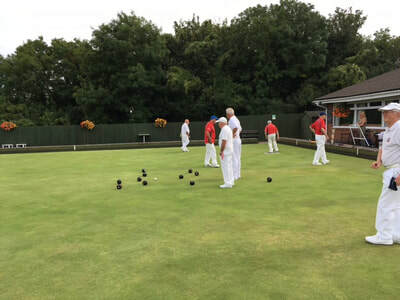 The green was lush and looked good but it proved to be on the heavy side at first, furthermore, it hid some devious and pernicious runs to which the home team seemed more accustomed. 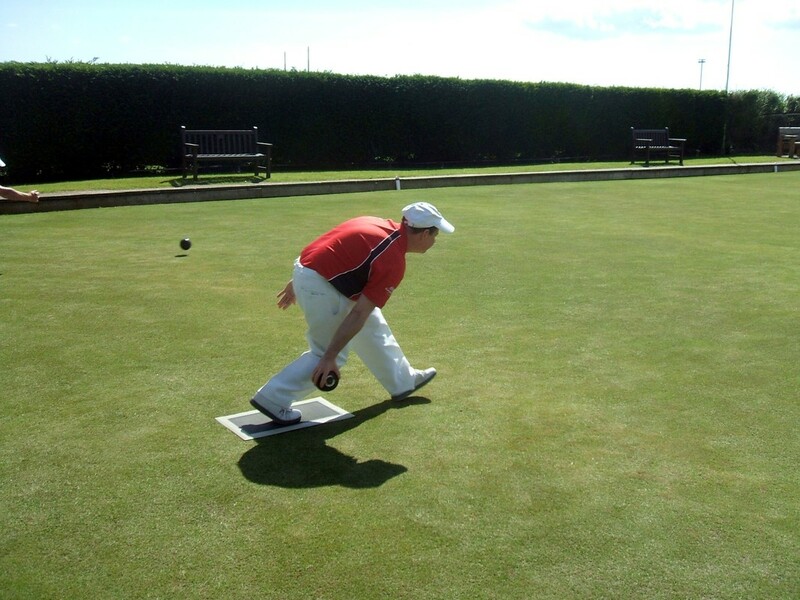 Not that the condition of the green greatly influenced the final result. 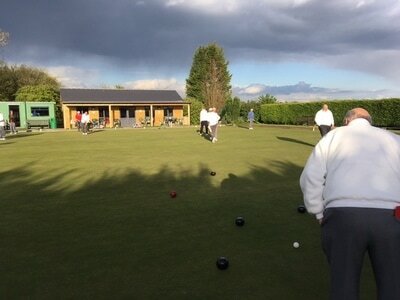 The home team proved too strong for the visitors. Brian Ilbery's rink got the most creditable result of the day, drawing 16-16, a solid performance in the context of the whole match. 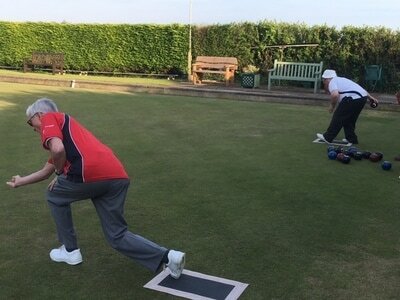 Iain Russell's rink lost 9-26, Dave Hughes's 11-23 and Ian Broxton's 8-36. There was some small consolation in the post-match catering which was excellent. Thanks Llantrisant and so it's home to Pontyclun next Saturday for the third match in the Carruthers Shield. To coin another, not so recent political slogan adopted by Tony Blair: "things can only get better"? The General Election is in just under 4 weeks and Theresa May keeps on about the need to be "strong and stable". 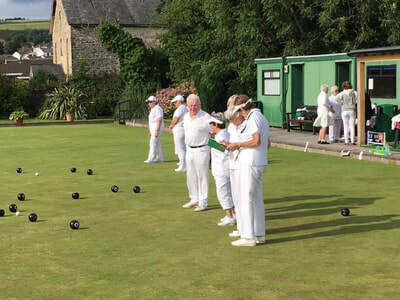 The Pentyrch team followed that philosophy, but only towards the end of their match against the men from the town of castle and cheese, but with a favourable result. 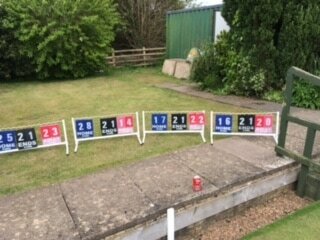 The spectacular nature of Pentyrch's final sprint can be seen in the statistics of the last 3 ends: Pentyrch's 4 rinks scored a combined 29 shots with Caerphilly only replying with 2. 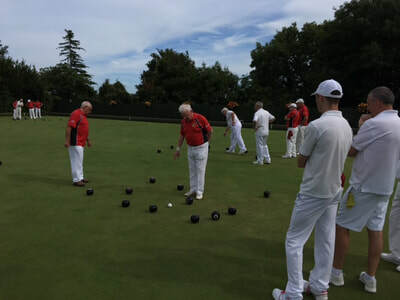 A hard-fought win by 15 shots saw the Tyrchs through the first match of this year's WBA Carruther's Shield preliminary rounds. The two winning rinks were skipped by Ian Broxton with a pleasingly symmetrical score of 21-12 and Brian Ilbery's rink 29-17, including a magnificent 7 shots in end 19. 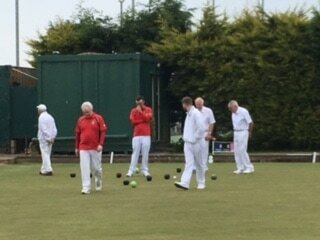 Dave Hughes's rink rallied at the end only losing 18-20. Iain Russell's rink had a bad day at the office by the high standards they have set so far losing 16-20 but were an important part of the aforementioned final sprint. Well done everyone! 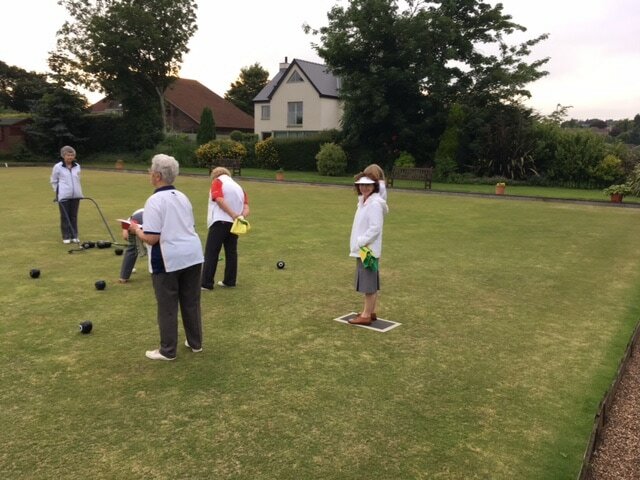 Thanks to the Ladies for the catering and Dave the barman - more volunteers are always appreciated (hint) Final thanks to Denzil for his wonderful impersonation of Freddie Mercury. A gloriously sunny evening to end a gloriously sunny spring day welcomed Whitchurch Hospital in a CMWL fixture - usually they experience wind, rain and sometimes hailstones but today the weather was kind to them. The sunny conditions proved to be difficult when bowling towards the tennis courts with the setting sun making it hard to focus. The dry conditions are also making the pace of the green very quick and tricky into the season. The visitors got the better of the Tyrchs by 10 shots. 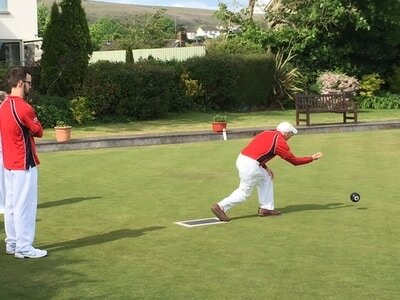 Iain Russell's rink won with Brian Ilbery's rink getting a draw. 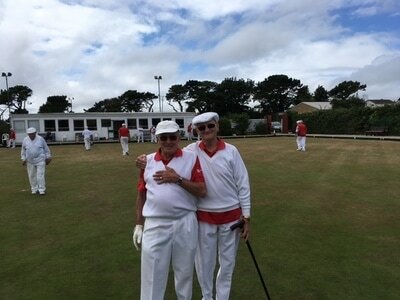 Ian Broxton and John Berry's rinks in defeat. A commendable result at Sophia Gardens where Cardiff Bowling Club are always hard to beat. 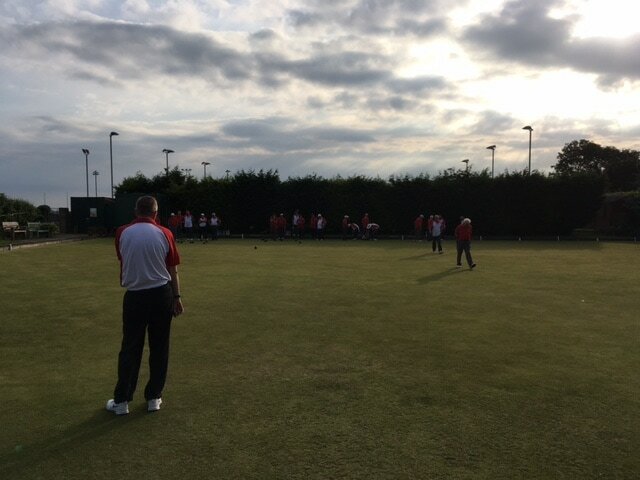 One rink winning by one shot, 16-15 and the other losing 17-10 but coming back strongly at the end of the match. 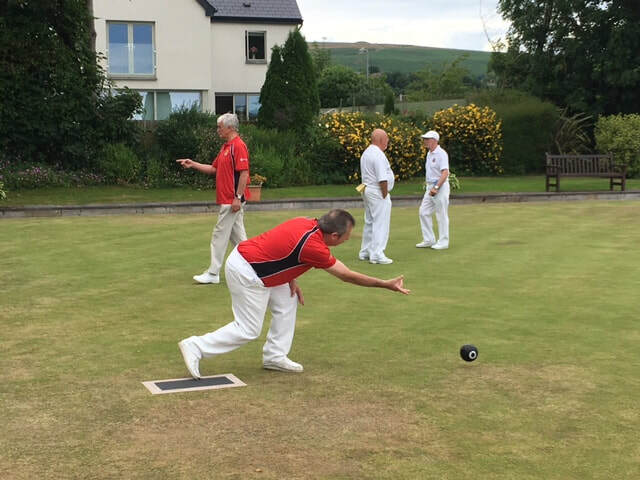 The Tyrchs won their first match of the season against the Mackintosh in the first PG1 match of the season. At the fifth attempt a close and hard-fought victory by seven shots over our good friends from the Mackintosh. Two rinks won and two rinks lost. The green is getting faster after very little rain during the past few weeks and both teams enjoyed playing on a good surface. 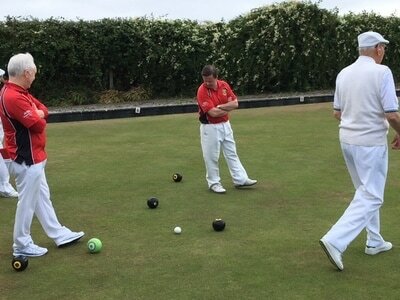 Iain Russell's rink were back to winning ways, 25-23 despite dropping 5 on the last end. Ian Broxton's rink won convincingly 28-14 against Tony Sullivan's rink. 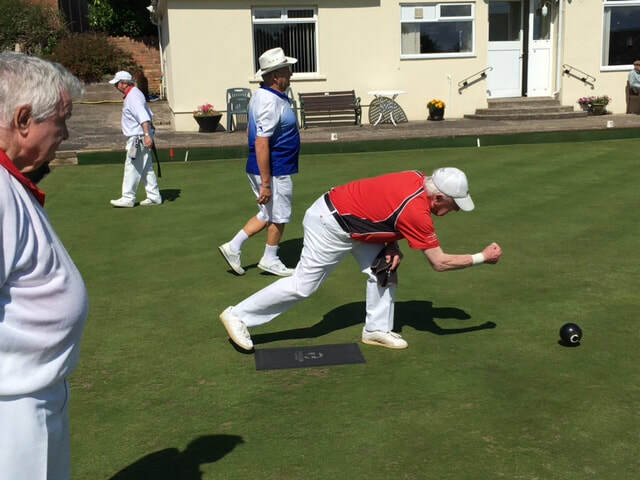 Brian Ilbery's rink went down 16-20 against Steven Hole who was unbeatable as a skip today, drawing, firing and defending with great skill. John Berry's rink let an early 6-1 lead slip eventually losing 17-22. Brian Pinnell alluded to the great relationship between the two clubs in his post-match speech and that will continue later in the season when we travel to the Macks. Just 16 players were available for this away fixture in the Cardiff Mid Week League. 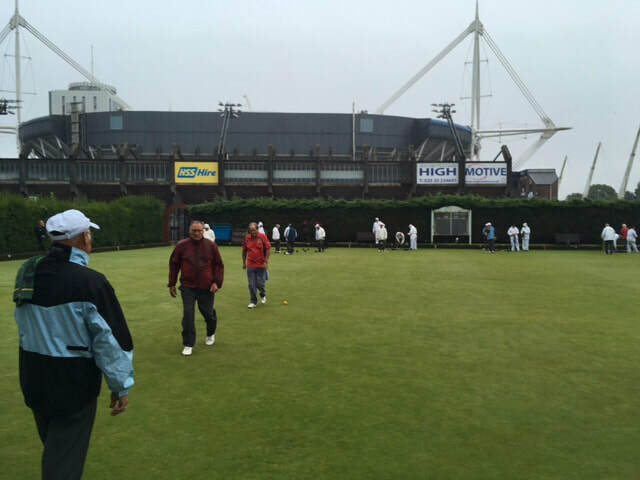 A visit to Sophia Gardens against a strong Cardiff team with two Mackintosh defectors and captained by the irrepressible Gary Duffy. 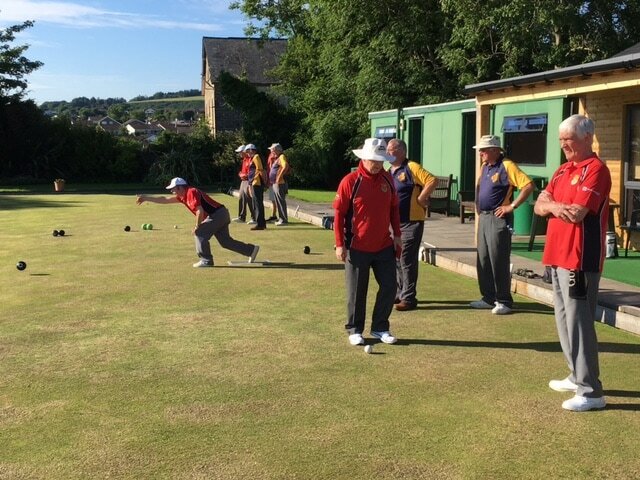 This fixture is always a difficult one and this evening proved to be no different - Iain Russsell's and Ian Broxton's rinks put up brave displays but still lost. 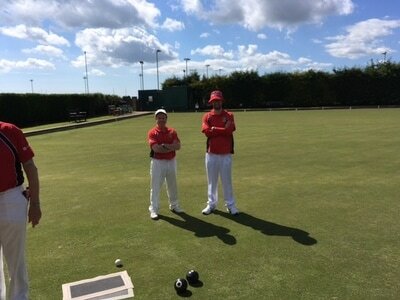 Ian Broxton losing 13-17 and Iain Russell losing 11 -17. John Berry's and Mark Krawiecki's rink with greater margins of defeat: Mark Krawiecki lost 10-22 and John Berry's rink, 5-24. The Ladies got the season under way and played their first match of the season at home to Whitchurch in the Glamorgan Evening League. 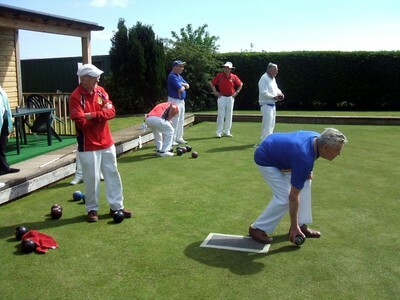 The second CMWL fixture saw Penylan coming to Pentyrch. 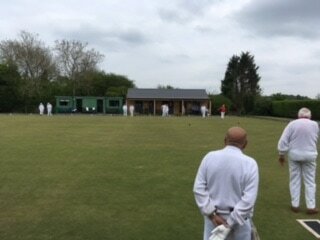 A cold wind accompanied by occasional sun and finally a huge ominous black cloud that threatened worse than happened formed the backdrop to a heavy defeat for Pentyrch. 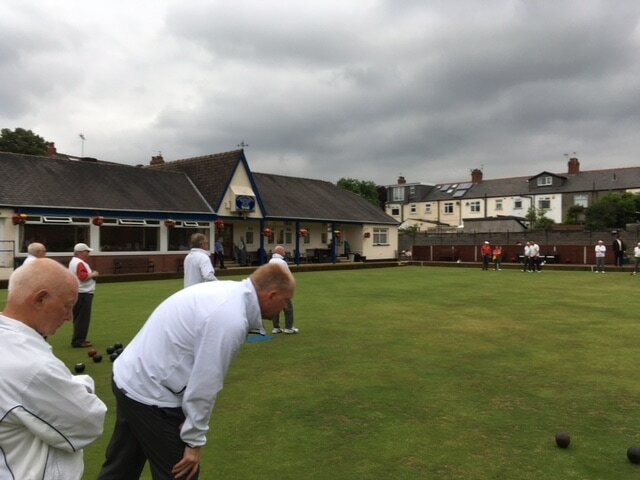 The ominous black cloud persuaded both captains to call the match too an early finish after 16 ends. Penylan brought a strong team that proved too good for Pentyrch winning 85-33. 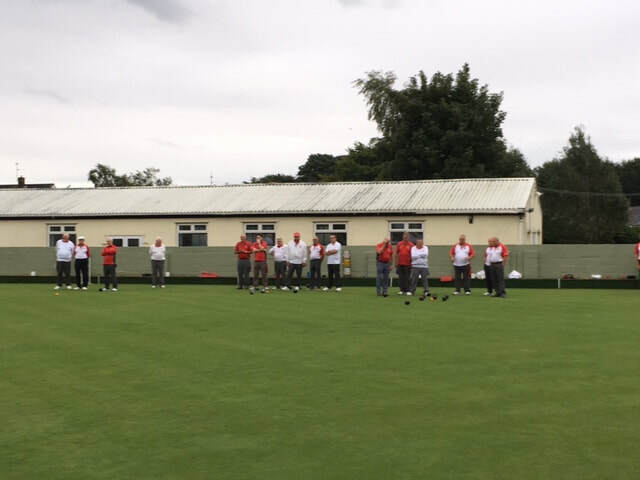 Iain Russell's rink, unchanged for the third match in a row came closest, losing 13-16. 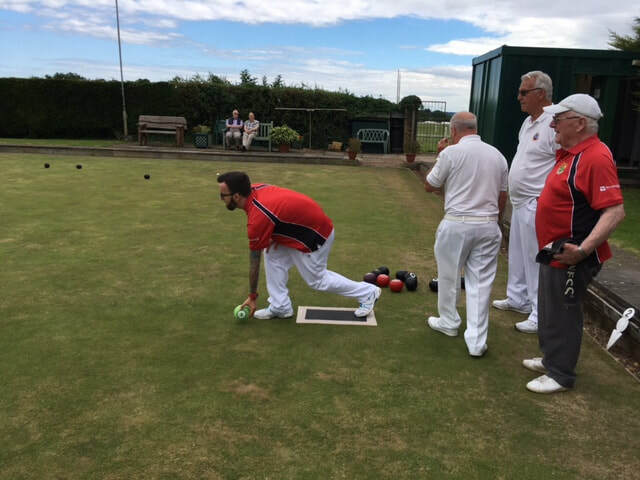 Mark Krawiecki's rink were never close suffering from some very accurate bowls from opposition third and skip, Mark Osling and Kevin Lewis. 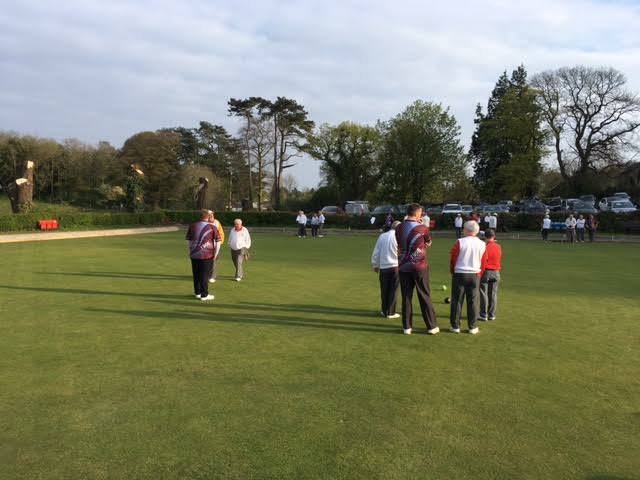 Brian Ilbery's rink also lost heavily to Mark Letman's rink 22-8. Don Wibley playing and skipping for the first time this season lost 24-6. It was also good to see John Berry back on the green. 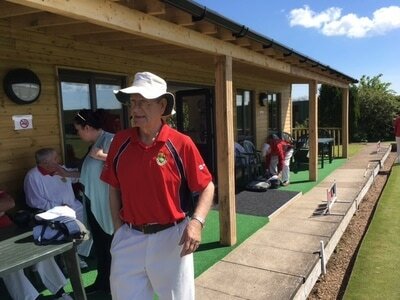 A generous and gracious speech from Penylan captain, Wayne Letman, made reference to the fact that it was the first time the new pavilion had been used to entertain an opposition team after a match. A fact worth mentioning and celebrating. The long-awaited first home match to Christen the new pavilion and blue skies and a brilliant sun shone down on a glorious scene. It was a fitting occasion to be hosting our great friends and bitter rivals from Taffs Well: our neighbours from down the mountain. It was the first leg of the famous Garth Cup withboth teams keen to make a telling start. 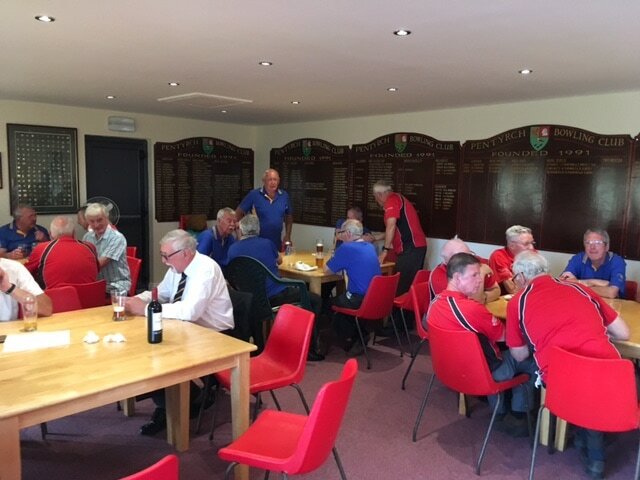 The Pentyrch party was slightly spoiled by Taffs Well who won with a 23 point margin, a useful lead going into the second leg. The final score was 97-74 to Taffs Well, although honours were even with 2 rinks won each. For Pentyrch Iain Russell's rink won convincingly 30-16 against Mike Yanez. 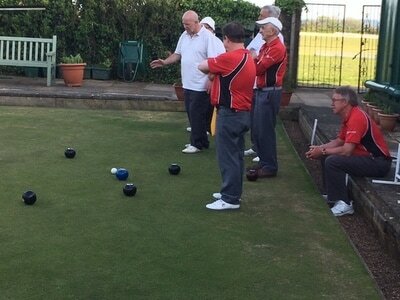 Brian Ilbery's rink gained a hard earnt 20-16 win against A.Ashman. 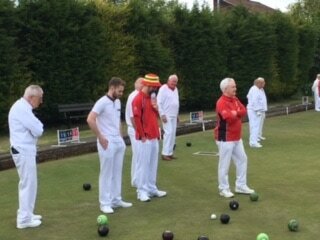 Mark Krawiecki's rink were not good enough to beat Ian Best, going down 29-17 and Peter Mynett's rink lost heavily to Ron Brown 36-7. Pentyrch won the 5th friendly rink - thanks to Taffs Well for making up numbers to allow the game to be played and thanks to Nick Russell for playing at short notice. ​We look forward to the second leg on September 16th. The Tyrchs under the leadership of new captain, Howard Thomas made the three and half mile journey to local friends and rivals, St Fagans for the first fixture of the season. The stark sight of the recently butchered horse chestnut trees that used to shade the green was a shock to those who had not seen them before. 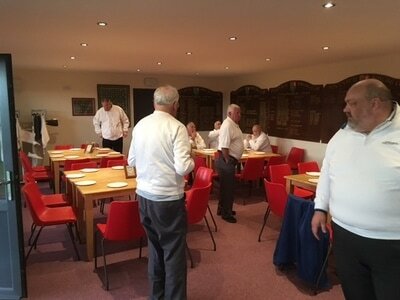 In fact, Peter Mynett once, and John Beecham twice passed the venue through not recognising it due to the unfamiliarity of the new surroundings! It was a close shave for St Fagans winning by only 8 shots, though not as close a shave as that inflicted on the aforementioned trees. Iain Russell's rink which included debutant John Tyler won convincingly 24-9. Mark Krawiecki's rink went in to the final end 13-13, winning 14-13 in a match that was close from start to finish. Brian Ilbery's rink lost 18-6 and Peter Mynett's rink went down 25-13. Thanks to Russell Howell for coming as reserve. An encouraging start to the new season. 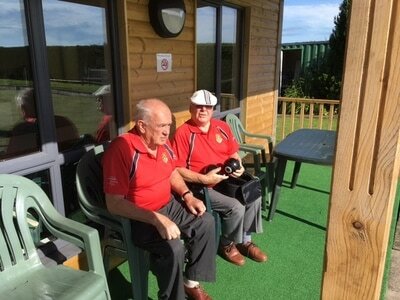 Good to see former members Mike Morgan (St Fagans) and his grandson, Tim (Barry Athletic) supporting their friends.